In the previous 32-year history of the Northeast Conference Women’s Basketball Tournament there have been many standout games, spectacular shots, and memorable moments…and then there was the 2014 quarter-final contest between the Saint Francis Red Flash and the Sacred Heart Pioneers. It’s a game that has to be placed in a separate category, because the NEC Tournament hadn’t seen anything like it before and hasn’t seen anything like it since. On Sunday, March 9, 2014, Saint Francis U and Sacred Heart stepped into the DeGol Arena in Loretto, PA for a late-afternoon playoff match-up pitting the sixth seeded Pioneers up against the third seeded Red Flash. It would be a rematch of the previous year’s semi-final, won by SFU 83-67, and a matchup between two programs who had combined to win nine out of the previous 12 tournament championships. The Pioneers were in their first year under Jessica Mannetti. Sacred Heart had lost their senior point guard Ericka Norman earlier in the season due to injury, and was stumbling to the finish line. After starting 7-2 in NEC play, the Pioneers lost seven out of their last nine games going into the conference tournament. While managing to keep their conference tournament qualification streak alive, making it to 15 straight conference tournaments at that point, the sixth seed was the lowest seed the Pioneer program had ever earned. On the other side, the Red Flash entered 2014 with a chip on their shoulder and something to prove after a 39-point loss to Quinnipiac in the previous year’s championship game. The Red Flash routed Wagner in their regular season finale, 101-75, to clinch a first-round home playoff game at DeGol Arena, a facility in which they had won 24 consecutive home playoff games, a streak dating back to the early 90’s. SFU senior Alli Williams punctuated a 2014 first team all-conference season with a 47-point performance against the Seahawks. From the onset, the game moved at a blistering pace. SFU would hold a 53-47 lead at intermission. The Pioneers fought back with a 12-4 run right out of the break to force a tie, and managed to take back control of the scoreboard on a Gabby Washington three nearly 30 seconds later. With 38 seconds remaining in regulation the Pioneers were protecting a seven-point edge, 100-93, following a pair of made free throws by Washington. It was the first time Sacred Heart had hit the century mark in a single game since 1985. Things seemed grim for the Red Flash, until SFU junior Alexa Hayward quickly converted a jumper to move the Flash to within five. Then, following a timeout, Corissa Archer forced a steal. She would give It up to Williams, who was fouled. Williams made good on both of her free throws, and suddenly, it was a one possession game. With 12 seconds to spare in regulation, Hayward converted a layup to bring the Flash to within a single point. On the other end, SHU point guard Katie Shepard made one out of two from the charity stripe. With time running out, Hayward raced down the court in desperation, penetrated towards the basket, and fed it to Alli Williams, who converted the layup with just one second remaining to tie the game and send it into a bonus session. In overtime, once again, SFU saw their season flash before their eyes in the final seconds. Trailing by three, 115-112, and under 20 seconds to go, Alexa Hayward drove hard to the basket, drawing a foul while converting the shot, to earn an “and one” opportunity. After Hayward completed the old fashioned three-point play to tie the game, Hannah Kimmel missed a shot at the buzzer for SHU. With the outcome still unsettled, the teams would have to play on. Eventually, the duo of Williams and Hayward would prove to be too much for Sacred Heart. In the second overtime, Williams and Hayward combined to score 13 out of the 17 Saint Francis points, leading SFU to a thrilling 132-124 victory, and a chance to live and play another day, against Mount St. Mary’s in the NEC Tournament semi-finals. Now looking back, five years later, there are still several eye-popping numbers associated with this game that stand out. First, the 256 combined points set a new mark as the second highest scoring NCAA women’s basketball game in history (Behind Kentucky over Baylor in four overtimes, 133-130, from earlier that season). Also, prior to this game, no NEC team had ever reached 100 points in an NEC Tournament game. On this day, not only did both teams reach the century mark, but they both did it by the end of the first 40 minutes! The game also featured not one, not two, but three 40-point scorers – Alli Williams and Gabby Washington each setting a new NEC Tournament single game scoring record with 47 points apiece, and Alexa Hayward who finished with 43 and tied a NEC tournament record with 16 made field goals. For Williams it was a second straight 47 point showing, equaling her career high. The see-saw affair saw a total of 12 ties and 22 lead changes. Yes, you read that right…22 lead changes! Finally, in a feat that would seem nearly impossible in a game like this, the Red Flash committed a grand total of just NINE TURNOVERS on the afternoon! The Saint Francis Red Flash would go on to defeat Mount St. Mary’s in a tightly contested semi-final, 68-63, before running out of steam in the NEC Championship Game against rival Robert Morris, 78-64. Sacred Heart would bounce back to win 11 conference games in 2015, and then go 16-2, win the regular season title, and host the NEC Championship Game in 2016. The 132-124 double overtime thriller remains an NEC Tournament ‘Instant Classic’ and one of the most iconic games ever played in the NEC Women’s Basketball Tournament. *2019 NEC TOURNAMENT PREVIEW:2019 will mark the 33rd annual Northeast Conference Women’s Basketball Tournament. After a year experimenting with a ‘pod system’ format in which the top two seeds each hosted two quarter-final games and one semi-final game, the tournament returns to the ‘higher seed hosting’ format, previously used from 2011-2017. After the quarter-final round, teams will be reseeded so the highest remaining seed plays the lowest remaining seed in the semi-finals. The quarter-finals will tip off on Monday, March 11th on NEC Front Row, with the semi-finals airing on both ESPN3 and NEC Front Row on Thursday, March 14th at 7pm. For the 12th straight season, the NEC Championship Game will air on ESPNU on St. Patrick’s Day, Sunday, March 17th at 2pm. Home court advantage has certainly mattered in the early rounds, as under the previous ‘higher seed hosts’ format from 2011-17, home teams were 24-4 in the quarter-finals, only 7-7 in the semi-finals, and 5-2 in the championship game. The only team in history to ever win three straight road games on their way to the tournament title was the 2015 St. Francis Brooklyn Terriers. As the #5 seed, they won at Sacred Heart, Central Connecticut, and Robert Morris en-route to their program’s first ever championship. The top four seeds here in 2019 (Robert Morris, Sacred Heart, St. Francis Brooklyn, and Saint Francis U) are a combined 31-5 at home this year against conference competition. Two new teams are set to enter the tournament field from the eight who qualified a year ago, Wagner and Mount St. Mary’s. The Mountaineers last qualified in 2017, while the Seahawks are making their first tournament appearance in five years. The Sacred Heart Pioneers are making their 20th consecutive NEC Tournament appearance in 2019, extending their own league record. The Bryant Bulldogs are also appearing for a seventh straight season. They have made the conference tournament every year since they were first eligible back in 2013. Wagner, making just their third playoff appearance in the last 15 years will look to pick up their first playoff win since the 2002 quarter-finals. For Fairleigh Dickinson, seeded eighth for a third straight year, the tournament victory drought has been even longer. The Knights haven’t won a playoff game since their 1992 Championship Game victory over Mount St. Mary’s, a streak of 20 straight playoff losses over the last 26 years. The Saint Francis Red Flash are the reigning tournament champions, and have won a league record 12 tournament titles overall. There have been six repeat winners in history, and this season the Red Flash will look to become the first repeat champion since the Robert Morris Colonials in 2016 and 2017. Speaking of the Colonials, they will be the tournament’s top seed for a fourth time in history and have home court advantage throughout the tournament. The #1 seeded team has won it all 19 times in the previous 32 seasons. Robert Morris has advanced to the championship game in each of their last five straight seasons. If they can navigate their way back to the final again in 2019, they’d be the first team to play in six straight title tilts since SFU went to seven straight from 1994-2000. Before the quarter-finals tip off on Monday night, check out our quarter-final previews for all four first round matchups, located below in the “A Look Ahead” section. *PLAYER OF THE YEAR…A CLOSER LOOK: Five weeks ago, here on the NEC WBB Fast Break, we did a mid-season awards column, highlighting some of the top candidates for each of the NEC’s top honors at the half-way point. Now the regular season has been completed, the coach’s ballots are due in, and the winners are set to be announced by the Northeast Conference on Monday morning, prior to the tip-off of the women’s basketball quarter-finals on Monday night. One of the most interesting decisions will be in choosing the 2019 Player of the Year. At mid-season we highlighted five potential candidates: Jess Kovatch, Katherine Haines, Jade Johnson, Sydney Holloway, and Juliette Lawless. Over the final five weeks, Lawless fell off the pace due to a mid-season injury that caused her to miss a game and be very limited in a few others. For Holloway, she averaged a double-double, making her a virtual lock for a first-team all-conference bid, but a Player of the Year honor seems a little out of reach due to a mini-mid-season slump where she averaged only 13.5 points and 8 rebounds over an 11-game stretch. Then, you have the rise of Amy O’Neill, who jumped into the mix by leading the nation in assists and producing a pair of triple-doubles during the month of February. KATHERINE HAINES: Haines’ first half highlights include the first triple double in league history involving blocks and achieving her 1,000th career point early in the conference season. In the season’s second half, while Kovatch’s numbers have slipped, Haines has been on a tear. Over the last six games, Haines is averaging 19.7 points and 9.5 rebounds, on 52.9% shooting and 47.6% from behind the arc. If you go back even further to January 28th against Robert Morris, really the only conference game Haines struggled in (7 points, 4 rebounds, on 2-10 shooting), Haines is averaging over 18 points and 9 rebounds on over 50% shooting in her last 10 games. Haines’ 13 double-doubles are third most in the league behind Holloway and LIU’s Brandy Thomas. To compere, Haines’ numbers are very similar to the numbers of Sacred Heart’s last Player of the Year, Hannah Kimmel, in 2016. JADE JOHNSON & AMY O’NEILL: Jade Johnson has had an incredible junior season offensively, scoring 19.9 points per game, while connecting on 97 made threes. All of those numbers are spectacular, but also are all second to Kovatch. Johnson’s teammate, Terrier senior Amy O’Neill has quietly developed a Player of the Year resume by significantly contributing in all areas. In the past, point guards usually don’t fare well in Player of the Year voting, perhaps because, as the primary facilitator, they don’t put up the crazy scoring numbers or rack up a ton of rebounds. The most recent ‘point guards’ to win Player of the Year were RMU’s Anna Niki Stamolamprou and Angela Pace, and in both cases, point guard wasn’t their natural position, they were moved there out of team necessity due to injuries and graduations. Excluding her 28-point scoring game last week against Bryant, O’Neill hasn’t put up big points, mostly because she’s been setting up her teammates, like Johnson, at such a high level. In addition, when you factor in that she leads the entire nation in assists, she leads her team in rebounding (as a point guard), and is one of the top defenders in the NEC (all while virtually never coming off of the floor – she has the most minutes played in the league), O’Neill’s complete resume definitely has her up there as an ‘NEC Elite’ player. The official Player of the Year announcement, as well as the announcements of all individual award and all-conference winners, will take place at 10:00am on Monday, March 11th on the NEC Sports official Twitter page @NECSports. The Colonials and Knights are set to square off in the NEC Tournament quarter-finals for the fourth time in the last five years. The Colonials swept the regular season series in 2019 with a pair of defensive gems. In January, RMU held the Knights to just two first quarter points, only 49 points overall on the evening, and 32% shooting in a 71-49 victory in western Pennsylvania. In February, the Knights were outscored 23-9 in the first quarter, and held to 43 points on 35% shooting, in RMU’s 63-43 win in the Garden State. Robert Morris has won their last eight straight meetings with the Knights. The Knights haven’t defeated the Colonials since sweeping RMU during the 2015-16 season. However, Robert Morris would manage to rebound in the 2016 NEC Tournament, eliminating FDU 68-59. They would again spoil Fairleigh Dickinson’s season in 2017, knocking the Knights out of the tournament, 68-35. Robert Morris began the year with an impressive 11-game win streak to start conference play. Their 16-2 conference record ties the 2008 team and last year’s team for the second best conference record in program history. The 2010 Colonials finished one game better at 17-1. The Knights went winless in February (0-7) for the first time since 2005. However, they managed to turn it around and win their final two regular season games to clinch the eighth and final playoff spot. *Preseason favorite Robert Morris returns to the post-season for the sixth straight season, and for the 14th time in the last 15 years. *The tournament’s #1 seed has won 19 out of the previous 32 NEC Tournament championships. In the 24 years since the discontinuation of the 6-team bracket, the #1 seed has won 17 times and has only missed the championship game on five occasions. *RMU has appeared in five straight NEC Championship Games, the most since Saint Francis U appeared in seven straight title tilts from 1994-2000. *The Colonials are 13-5 all-time in the quarter-final round. They have won eight straight quarter-final playoff contests. The last time RMU failed to record a win in the quarter-final round was a 72-60 loss to Saint Francis in 2009. *RMU has won six consecutive home playoff games and 17 out of their last 18. The Colonials are 21-2 all-time at home in the NEC Tournament. Their last NEC Tournament loss on their home floor was a 2015 NEC Championship Game setback to St. Francis Brooklyn, 77-62. *This is Charlie Buscaglia’s 14th NEC Tournament as an assistant or head coach at Robert Morris. While working for 13 seasons as an assistant under his dad, Sal Buscaglia set a NEC record with 20 tournament wins as a head coach. Since taking over in 2017, Charlie has led the Colonials to five tournament wins in two years, including a title in 2017 and a championship game appearance last year. *The Colonials are appearing in their 24th NEC Tournament, with a 33-17 overall tournament record. *The current run of five straight tournament appearances is the second longest streak in program history. From 1992-1998 FDU appeared in seven straight conference tournaments. *The Knights were seeded as high as #5 in 2004 and 2008, but have not been seeded in the top four since they were the #1 seed in 1993, falling on their home floor to #4 seed Marist. The Knights are the #8 seed in 2019 for the third straight season. Last year they fell to the #1 Saint Francis Red Flash 89-70 in Loretto. *Fairleigh Dickinson was knocked out of the playoffs by Robert Morris in the quarter-final round for three straight seasons from 2015-17. *FDU is on a 20 game NEC Tournament losing streak. They have not tasted victory in a NEC Tournament game since their 78-55 victory over Mount St. Mary’s in the 1992 NEC Championship Game. The Knights are 10-24 all-time in the NEC Tournament. *Only once in NEC Tournament history has a #8 seed defeated the #1 seed. In 2007, #8 seeded St. Francis Brooklyn pulled off the historic upset against the #1 seeded LIU Brooklyn Blackbirds. The Terriers were led by a 20-point effort from Sarah Bratton. The Sacred Heart Pioneers have appeared in 20 straight NEC Tournaments. Back in March 2000, in their very first NEC Tournament game in program history, the #3 seeded Pioneers were upset in the quarter-final round by the #6 seeded Wagner Seahawks, 59-56. Monday night will be their first playoff meeting since. Presently, the Pioneers have dominated the series. They’ve won 11 straight games against the Seahawks, sweeping them five straight years. The last time Wagner defeated Sacred Heart was back in January of 2014, during Jessica Mannetti’s rookie season as head coach. This year the teams met twice within a nine day span in mid-January. During the first meeting in Staten Island, Kat Haines recorded a double-double with 22 points and 13 rebounds, while Candice Leatherwood added 20 points. In the rematch, Leatherwood again reached 20, while Haines scored her 1,000th career point, as part of a 19 point effort. Sacred Heart boasts one of the most experienced rosters in the league with two seniors and three grad students. The Pioneers began the season 6-0 in NEC play before dropping three in a row. They burst out of that skid with a 76-41 victory over Mount St. Mary’s on February 9th. Since that game, SHU has won eight out of their last nine games and their last five in a row entering the tournament. The effort has been on both sides of the ball. During this nine game stretch, the Pioneers are averaging 68.2 points, 44% shooting, and 8.9 threes per game. All this, while holding opponents to just 52.8 points per game, including holding three teams to under 50 points. On the other side, the Wagner Seahawks have been one of the biggest surprise stories in the NEC this year. After finishing at the bottom of the league standings four straight years, and being forecasted to finish at the bottom again this year, the Seahawks defied the odds, making the NEC Tournament for the first time since 2014 and for only the third time since 2004. While Wagner got off to a 7-5 start in league play, they have dropped five out of their last six to finish up the regular season, having to settle for the seventh seed. *Sacred Heart is back in the post-season for a 20th consecutive year, the longest active streak in Northeast Conference women’s basketball. SHU has earned a top three seed in 15 out of their 20 tournament trips. *The Pioneers have advanced into the semi-final round in 12 out of their previous 19 tournament appearances. SHU has been to the semi-finals three straight years and five out of the last seven. *SHU has won three Northeast Conference Championships (2006, 2009, and 2012). In 2009, the Pioneers became the 3rd team in NEC history to record a perfect 18-0 regular season on their road to the tournament title. *The Pioneers are the #2 seed for the fifth time in program history (2004, 2005, 2013, 2017, and 2019). Seven times the #2 seed has gone on to win the NEC Championship, with Robert Morris in 2008 serving as the last champion to start their journey at #2. *Sacred Heart has appeared in four NEC Championship Games, with their last coming back in 2016, a 56-51 loss at home to Robert Morris. *With another 18 win season recorded in 2019, the Pioneers have reached the 18 win plateau in 12 out of the last 16 seasons. With two more victories in this year’s tournament, the Pioneers would reach 20 wins for the 8th time since they joined Division I. *The Pioneers are 12-7 all time in the quarter-final round. SHU is also 17-8 all-time in NEC Tournament games played at the Pitt Center. *Wagner is back in the NEC Tournament for the 21st time in history, for the first time since 2014, and for just the third time since 2004. The Seahawks are the #7 seed for the third time in program history (1994, 2014, and 2019). *The Seahawks are 8-11 all-time in the quarter-final round and 14-19 overall in the NEC Tournament. Wagner has dropped their last five straight tournament games. Their last tournament win came back in the 2002 NEC Tournament quarter-finals when they beat Monmouth 73-59. *Only once has a #7 seed upset a #2 seed. That came back in 2003, when UMBC, in their final year in the league, upset #2 Quinnipiac in the quarter-final. In fact, the Retrievers would also upset #3 Monmouth in the semi-finals, before falling to SFU in the 2003 Championship Game. The #7 seeded 2003 UMBC Retrievers are the lowest seeded team to ever play in the NEC Championship Game. *Led by tournament MVP Maureen Coughlin, the Seahawks won their lone championship in 1989 with a 66-60 victory over Robert Morris. Wagner also appeared in the championship game in 1991 and 2000, both times making it to the final as a #6 seed. The Mount and St. Francis Brooklyn had perhaps the two most impressive non-conference seasons in the league this year. The Terriers went 6-6, scoring over 100 points in three out of their first five games. The six non-conference wins was their most since they won nine in non-conference play in 2014. For Mount, at 6-5, they finished with a winning non-conference season for the first time since 2000. In conference play, Mount started slow out of the gate at 1-4, but managed to win three straight games at the end of January, including a thrilling 78-75 win at home over St. Francis Brooklyn. After a three-game skid to start February, the Mount won four out of their next five to clinch a playoff spot after missing the tournament by one game last year. The Mount picked up their biggest win on February 16th, handing Robert Morris their first conference loss of the year, 61-55, in a game that Juliette Lawless was limited due to injury. The Terriers are enjoying a banner campaign in their first year under Linda Cimino. St. Francis Brooklyn’s 12 conference wins are the most ever for a single season in program history, and their 18 overall wins is their most since they won 19 games in 2013-14. St. Francis Brooklyn defeated Mount in their second meeting, just last weekend, in Brooklyn Heights. Freshman Ebony Horton led the way with 18 points and 8 rebounds, while senior Amy O’Neill flirted with a triple-double, recording 10 points, 8 rebounds, and 9 assists. Both head coaches, SFBK’s Linda Cimino and Mount’s Maria Marchesano will be coaching in their first NEC Tournament game. The Terriers are the three seed for a second straight year, but will be hosting their first ever playoff game at the Pope PE Center, after having to play out in Pennsylvania at a ‘neutral site’ last year. St. Francis Brooklyn will be trying to reach the semi-finals for the first time since they won in all in 2015, while the Mount will look to advance into the league’s ‘final four’ for the first time since 2014. *St. Francis Brooklyn is the #3 seed for a second straight season, equaling the highest seeding in program history. *Three times the #3 seed has won the NEC Tournament: FDU in 1990, Long Island in 2001, and Robert Morris in 2016. The #3 seed has also seen its share of upsets. 10 times the #6 seed has upset the #3 seed, including in each of the last two seasons. *The Terriers are making their 14th NEC Tournament appearance and their third straight. *Only three times have the Terriers advanced to the semi-final round: 1987, 2007, and 2015. In 2007 the Terriers pulled off a historic upset as the #8 seed, knocking off the top seeded LIU Brooklyn Blackbirds, before falling to Robert Morris in the semis. In 2015, the Terriers would again make history, becoming the first and only school to win three straight road games on the way to their first and only NEC Championship. *The Mount returns to the post-season in 2019 after missing the tournament by a single game last year, ending a run of six straight seasons in the conference tournament. *Mount has now qualified for the NEC Tournament a record 27 times and 27 out of the last 30 years. *The Mountaineers have appeared in seven NEC Championship Games, but none since 2001. The Mount is tied with Sacred Heart at three NEC Tournament championships (1993, 1994, 1995), for the third most in league history. *After falling in the 2001 final, it would be 13 years until the Mount would win another playoff game. They would advance to the semi-finals in back to back seasons in 2013 and 2014. *The Mount holds the distinction of earning the NEC’s first two automatic NCAA tournament bids after winning the conference tournament in 1994 and 1995. *Mount St. Mary’s is 3-0 all-time in the NEC Tournament against St. Francis Brooklyn, winning playoff matchups in 1994, 1995, and 1998. The Mount is 19-23 overall in the NEC Tournament, with a 13-13 record in the quarter-finals. The Bryant Bulldogs and the reigning champion, Saint Francis Red Flash, will square off for the first time ever in the post-season. The Bulldogs will become the 14th different postseason opponent for the Red Flash, who are the league’s most accomplished tournament team with 47 tournament wins and 12 tournament championships. After a 3-0 start in league play, SFU dropped their next three, including a 66-63 setback in Smithfield. Jessica Kovatch was held to 14 points, ending her streak of nine straight games over 20. The Red Flash would then win their next six in a row before dropping four out of their final six games. The Bulldogs endured a mid-season five game slide, but finished up playing their best basketball of the year, winning five out of their final six games to earn the #5 seed. Bryant secured the 5th seed with a 76-73 victory over Wagner in the season finale. With the game tied at 73, and just seconds remaining, senior Naomi Ashley stripped the ball from the Seahawks and converted an ‘and one’ three-point play opportunity to seal the game. Monday night’s game will also be the likely final home game in the remarkable career of ‘the one and only’ Jessica Kovatch. Kovatch, the NEC’s all-time leading scorer, will take the court at DeGol Arena with 2,795 career points and 461 career three pointers. Last year, Kovatch scored a single tournament record of 103 combined points over three games at DeGol Arena to lead the Red Flash to the NEC title. *The Red Flash will be making their 24th NEC Tournament appearance and their 10th in the last 11 years. SFU has won the most tournament games (47) and the most tournament titles (12) in NEC history. *Saint Francis U has won 43 out of their last 49 playoff games and has appeared in 17 out of the last 25 NEC Championship Games. *At DeGol Arena, Saint Francis has won 29 out of their last 30 home playoff games. Their lone home playoff defeat since the early 1990’s was a 65-57 defeat to Central Connecticut State in 2017. *The lone school to win the NEC Tournament as a #4 seed was the Robert Morris Colonials in 1991 when they defeated the #6 seeded Wagner Seahawks in the final. *This year marks just the 4th time the Red Flash have captured the fourth seed. SFU is 18-5 all-time in the quarter-final round. *Last year Jess Kovatch became the 7th player to win Player of the Year and Tournament MVP in the same season. Three players have won Tournament MVP in consecutive campaigns: Jess Zinobile 1999-00, Chinata Nesbit 2007-08, and Anna Niki Stamolamprou 2016-17. *The Bryant Bulldogs have qualified for the NEC Tournament seven straight seasons, every year since first becoming eligible in 2013. *Bryant is 5-6 all-time in the NEC Tournament and 5-2 in the quarter-final round. They had appeared in the semi-finals five straight seasons before falling in the quarter-finals last year to Sacred Heart. *The Bulldogs are the tournament’s #5 seed for a second straight season. Only once has the #5 seed won a NEC championship, the 2015 St. Francis Brooklyn Terriers. The 2015 Terriers are the lowest seeded team to ever win the tournament title. *The Bulldogs are the lone team in this year’s field to never win a NEC Championship. They appeared in their lone NEC Championship game in 2017, falling to Robert Morris in the final, 65-52. TWO: Erin Storck, GR (SHU): On a night when the SHU offense endured a near 17 minute drought without a field goal, Storck led a key mid-fourth quarter stretch by scoring five straight points to help pull SHU within one of Mount St. Mary’s. Later, with 2:44 left and the game tied at 43, Storck made the assist to Jayla Davis for what would go on to be the game winning basket. Finally, in the closing moments, Storck collected two consecutive offensive rebounds off missed free throws and sank three free throws of her own to preserve the win. Storck scored eight of her game high 16 points in the fourth quarter. The Sacred Heart grad student has scored in double figures five straight games to finish up the regular season, averaging 13.2 points during that stretch. Erin Storck will enter the NEC Tournament with 910 career points, 90 shy of 1,000. ONE: Sydney Holloway, JR (BRY): Holloway’s big plays in the fourth quarter helped to lead a Bulldog comeback over Wagner on Thursday night to help Bryant clinch the #5 seed. Training by five with nearly two minutes to go in the fourth quarter, Holloway rebounded a Khaleah Edwards three point try and scored a layup on the other end to pull Bryant within three. After Taylah Simmons scored to get Wagner back up by five, Holloway found Haley Connors for an assist on the three point ball to get Bryant within two. Holloway finished the night leading Bryant with 20 points and 9 rebounds, with 6 of those points and 7 of those rebounds coming during the fourth quarter. Over her last five games, Holloway is averaging 22.4 points and 8.8 rebounds. She finished the regular season leading the NEC in rebounding for a second straight year, and is top 15 in the nation with 17 double-doubles. *Prior to the 256 points scored in the 2014 NEC Tournament quarter-final between Saint Francis U and Sacred Heart, the NEC record for most combined points scored in a NEC Tournament game was 174 in Robert Morris’ 92-82 win over Saint Francis in the 2012 quarter-finals. The 2014 game smashed that record by a whopping 82 points. Three SFU players, Alexa Hayward, Rebecca Keegan, and Alli Williams, can lay claim that they have played in both of the top two scoring games in NEC Tournament history. Our NEC WBB post-season coverage continues on Wednesday, March 13th with a special semi-final playoff edition of the NEC WBB Fast Break column. We’ll recap the quarter-final round and preview both semi-final showdowns. Be sure stay with us all post-season long on the road to the 2019 NEC Women’s Basketball Championship here on the NEC Overtime! Blog. Moments before Saturday’s opening tip against the Bryant Bulldogs, St. Francis Brooklyn senior Amy O’Neill was escorted out to center court of the Pope PE Center by her mom and her teammate, Jade Johnson, as part of the Terriers’ Senior Day festivities. About two hours later, O’Neill would return to the center of the floor for a post-game interview on NEC Front Row, following a career-high 28-point, six rebound, nine assist, and two steal performance to help lead the Terriers to a 101-77 victory. Just as she’s been all season long, O’Neill was the engine that made the team go. Nearly three minutes into the game, O’Neill would pick up her first assist on a quick inbounds feed from the baseline to Ebony Horton underneath the basket for an ‘and one’ layup. With the assist, O’Neill surpassed Sacred Heart’s Ericka Norman, and her NEC single season record of 229 assists set back in 2013. This season O’Neill also finds herself leading the entire nation with 8.5 assists per game, and is the only player in the Northeast Conference to rank top 15 in scoring and top 10 in rebounds, assists, and steals. The Melbourne, Australia native began her basketball journey in the States as a point guard at Cowley College in Kansas. After her sophomore season in 2016-17, O’Neill was named a NJCAA Division I All-American, recording 16.8 points, 3.9 rebounds, 4.6 assists, and 2.5 steals per game. Meanwhile in Brooklyn, still searching for that steady point guard to lead the team following the graduation of Katie Fox after the Terriers’ 2014-15 championship season, the Terrier coaching staff was busy scouring the JUCO ranks. They found O’Neill, helped bring her to Brooklyn, and the rest, they say, is history. Coming to St. Francis Brooklyn last year to play for John Thurston, O’Neill was asked to not necessarily be the top scorer that she was at Cowley, but to be more of a pure point guard, running the offense efficiently and getting her teammates open. It was a role that was more natural and allowed her to fit right in. Following Coach Thurston’s retirement last spring, Linda Cimino was brought in as the Terriers new head coach, and has helped take O’Neill’s game to new heights in her senior campaign. When Coach Cimino had her first meeting with her new team, O’Neill flew halfway around the world from Australia to be there. In that initial meeting, Coach Cimino sensed an instant connection and had a pretty good feeling about Amy’s leadership and personality. Coach Cimino named her a team captain on the spot. O’Neill made history back on February 2nd when she recorded 13 points, 13 rebounds, and 12 assists in 44 minutes of action against the Sacred Heart Pioneers. After flirting with a triple-double on several occasions during the season, the senior finally achieved the historic feat, recording the first triple-double in program history. Two weeks later, she would produce a 16 point, 10 rebound, and 11 assist outing against the Terriers’ rival, the LIU Brooklyn Blackbirds. O’Neill became just the second player in league history to record multiple triple-doubles in a single season, and is one of just six women in the country to hold multiple triple-doubles this year. With potential future pro opportunities waiting for her back home in Australia, that couldn’t be more further from her mind right now. This season the Terriers are 17-12 overall and have clinched both a winning conference season and a double-digit victory conference season for the first time since 2013-14. With the regular season winding down and the postseason set to begin, O’Neill’s thoughts are squarely on her teammates and the mission at hand – bringing a second championship in the last five years to Remsen Street. With their 69-65 victory over Mount St. Mary’s on Monday night, Amy O’Neill and her St. Francis Brooklyn Terriers have clinched a home playoff game for the first time in program history. The Terriers will begin their postseason journey in the Pope PE Center on Monday, March 11th. But first, St. Francis Brooklyn will conclude their regular season on Thursday night in New Britain against Central Connecticut State. 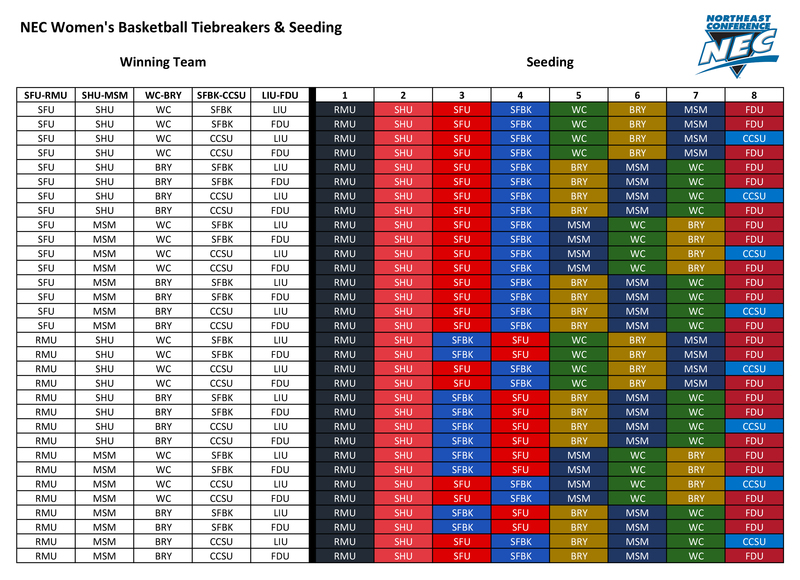 *TIEBREAKER-MANIA: 85 conference games have been played this season, and now it all comes down to the final five. Each team has one final game remaining in the 2019 regular season to decide their fate. For some, it’s all about boosting their positioning and seeding. For others, it will be to try and qualify for the NEC Tournament altogether. There are 32 possible combinations for how the final five games play out. But which combination will be THE combination? 40 more minutes of regular season basketball on Thursday night, for all 10 of the league’s teams, will decide that. ROBERT MORRIS: The Colonials have clinched the regular season championship for the seventh time in program history, and for the third straight season under head coach Charlie Buscaglia. They will be the tournament’s number one seed for the fourth time (2010, 2014, 2017, 2019), and for the third time in the last six years. Robert Morris will play all postseason games at the North Athletic Complex, where they are 15-0 all-time against NEC foes, since the facility opened at the start of last season. In addition to already knowing their playoff seed, and their playoff location, RMU also holds an edge in knowing their potential first-round opponents. The Colonials will host whoever emerges with the number eight seed, either Fairleigh Dickinson or Central Connecticut State. SACRED HEART: The Pioneers have clinched the #2 seed and will open up the postseason at the Pitt Center next Monday night. With the second seed, Sacred Heart is also assured of a semi-final home game, should they advance. Possible first round playoff opponents are Mount St. Mary’s, Bryant, or Wagner. SAINT FRANCIS U & ST. FRANCIS BROOKLYN: Both schools have already clinched a top four seed and a quarter-final playoff home game next Monday night. The Terriers will be hosting their first playoff game ever in the confines of the Pope PE Center while the Red Flash are no strangers to playoff games in DeGol Arena, they have won 29 out of their last 30 conference tournament games played there. Saint Francis U can clinch the number three seed with a win or with losses by St. Francis Brooklyn and either Bryant or Sacred Heart. St. Francis Brooklyn can jump up to the third seed for a second straight season with a win and a SFU loss. If both schools lose on Thursday night, SFBK can grab the three with wins by Bryant and Sacred Heart. Possible first round playoff opponents for both the three and the four seed are Mount St. Mary’s, Bryant, or Wagner. MOUNT ST. MARY’S, BRYANT, & WAGNER: These three teams will be seeded five through seven, with the positioning to be determined on Thursday night. Bryant has the inside edge as they can clinch the number five seed simply with a win over Wagner. A loss would drop the Bulldogs to either sixth or seventh. Mount can clinch the five seed with a win and a Bryant loss. If both win, Mount would be the six, while a loss would place the Mountaineers at either sixth or seventh. The Wagner Seahawks can reach the fifth seed with a win over Bryant and a Mount loss. A loss would slide the Seahawks down to seventh. FDU & CCSU: Fairleigh Dickinson and Central Connecticut State will go into the regular season finale both still alive for the eighth seed. FDU can punch their ticket into the conference tournament for a fifth straight year (and third straight year as the #8 seed) with a win on Thursday over LIU or a Central Connecticut loss. The Blue Devils, looking advance to their fifth straight NEC Tournament, will need to win against St. Francis Brooklyn and hope for a FDU loss to the Blackbirds. Whoever emerges with the #8 seed will head to Moon Township next Monday night to meet the top seeded, regular season champion, Robert Morris Colonials. *MEET THE WARRIORS: Back on September 10th, the Northeast Conference announced that Merrimack College, located in Andover, MA, had accepted an invitation to become the league’s 11th member. The Warriors will be incorporated into NEC schedules beginning next year, and will be eligible for the NEC Tournament beginning in the 2023-24 season, following a four-year NCAA Division I reclassification period. 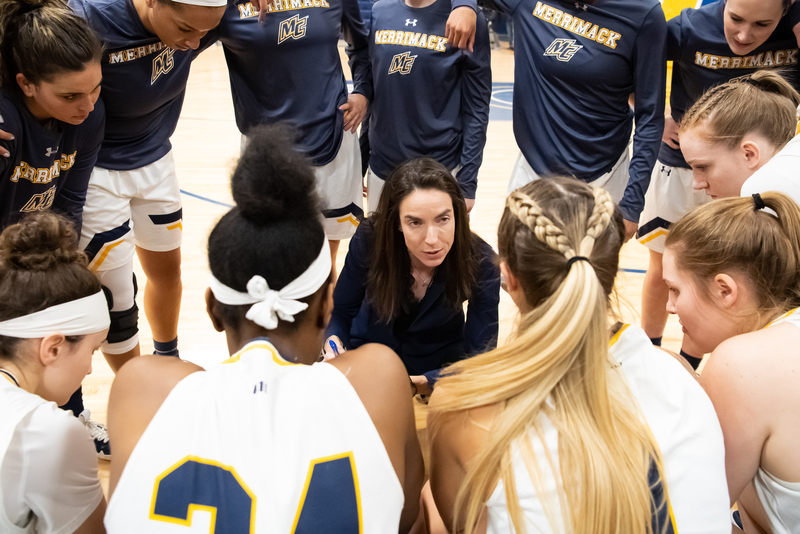 The Merrimack women’s basketball program won a Northeast 10 Tournament championship back in 2004, winning 31 games and advancing all the way to the NCAA National Semi-Finals. This season, Merrimack qualified for their conference tournament for a third straight season, and for the fourth time in the last five years. 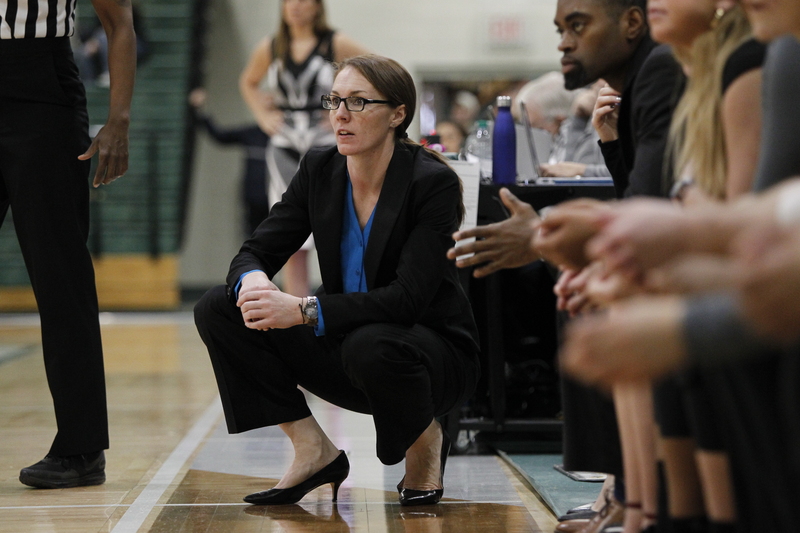 The Warriors are led by eighth year head coach Monique LeBlanc. Current junior forward Denia Davis-Stewart is one of the leading rebounders in the NE-10, averaging 11 per game, while serving as the team’s second leading scorer at 13.4 points per game. The Dorchester, MA native was recently named the Northeast 10’s Defensive Player of the Year. CD: What are some key things about the Merrimack women’s basketball program that are important for Northeast Conference women’s basketball fans to know? ML: Something I’ve learned really quickly coaching in this conference (Northeast 10) is that it has some of the best coaches in the country. You can start with Barbara Stevens at Bentley and over 1,000 wins and countless conference championships. She’s chosen to stay in this league and continue to coach at Bentley. We’re talking about some of the best coaches in the country that we are competing against at least twice a year. There’s some great history and tradition in this conference. There are 15 teams in this conference, it’s a big conference, strong top to bottom, and every game you have to be ready to go. The level of play is really high, there is a really high talent level in the league, and the level of coaching is really good. With all of that, we feel ready to compete. We have the mindset that going into the NEC we’re going to be competing against great players and great coaches, and that’s already been our life here. So we feel ready in that regard. CD: How would you describe your team’s style of play to NEC basketball fans? ML: I think they are going to see a team that plays really hard. I think that’s always been the way people describe us, that we compete and play really hard. The type of team we are this year…we press a lot and we play a lot of aggressive zone defense. Offensively, I think the trend everywhere is ‘we want to play fast, we want to push.’ But we also want to work for great shots. So we’re not ‘play fast at all costs,’ But comparing what we currently have to what we are going to be going up against next year, are we going to be a 100% press and zone team next year? I don’t know. But that’s what we’ve been for the last few years. CD: What have been some of the highlights of your season this year? ML: A big highlight is our mental toughness and how we’ve played down the stretch. We started conference play 0-4, playing against four very good teams right off of the bat. Our team had higher hopes for the season and that was a little bit of a crossroads, getting over seeing yourself as a last place team at that moment. Knowing that we still had a lot of games to go, staying tough, and continuing to focus on getting better every day, I’m really proud of that. When we finished the first round of divisional play we were 2-5. Since then, we went 10-4. So I think that’s been a highlight for us. We certainly didn’t start the way we wanted to, but we felt that we were playing really good basketball and just a couple of possessions away in every game. CD: Finally, looking ahead, what is the plan for taking the necessary steps over the next few years to make sure that you’re are ready to compete the first year you are eligible for the NEC Tournament? ML: We’re going to spend four long years competing hard and still trying to position ourselves to say at the end of the season ‘if we could have been eligible we would have been in there.’ That will be the immediate goal to put ourselves in the position where we feel like we could have been in that mix. After four years of working towards that, I know we’ll be chomping at the bit to be part of it. There will be a lot of emphasis on recruiting, and making sure that we are attracting the level of student athlete that we need to find ourselves in that spot. Hopefully we’ll find ourselves in that mix year one when we are eligible. Prior to taking the court against Northeast Conference competition next season, NEC women’s basketball fans will have a chance to meet Coach LeBlanc and the Warriors as a part of NEC Social Media Day in October. *COMLY REACHES 1,000: The latest to join the NEC’s 1,000 career point club is Fairleigh Dickinson senior Madelynn Comly. With the Knights visiting Emmitsburg, MD and the Mount St. Mary’s Mountaineers on Saturday afternoon, Comly was able to make history just across the border (about 20 miles away) from her hometown of Littlestown, PA. Comly reached the 1,000-point plateau on a late third-quarter three ball, becoming the 18th player in Fairleigh Dickinson women’s basketball history to reach the milestone. The senior guard entered the day at 991 career points. She would finish by leading the Knights with a game-high 20, in a 62-57 loss to the Mount. Comly joins fellow NEC 1,000 point scorers from this season: Kiana Patterson, Sydney Holloway, Katherine Haines, Maria Palarino, and Jade Johnson. Two other senior guards in the NEC are closing in on 1,000, however unless they produce some big scoring games and their teams make deep runs into March, it appears they will fall just short. Mount St. Mary’s guard Juliette Lawless has 915 career points, 85 shy of 1,000, and Sacred Heart grad student Erin Stork is at 894 career points, 106 shy of 1,000. *400 WINS: The NEC’s longest tenured head coach achieved a historic milestone on Monday night, as head coach Mary Burke recorded her 400th career victory as a result of Bryant’s 69-54 win over LIU Brooklyn. Ironically, Burke’s 300th career win was also in a game against LIU Brooklyn back in January of 2013. Coach Burke joined Bryant as an assistant back in 1987 and took over as the head coach in the summer of 1991. Now in her 28th season as head coach, Burke helped transition Bryant from the Northeast 10 into Division 1 back in 2008-09. The Bulldogs have qualified to the Northeast Conference tournament every season since they were first eligible in 2013, reaching the semi-finals four times, and the NEC Championship Game in 2017. The final five games of the 2019 regular season will commence on Thursday night to complete the playoff picture. The first game to tip off, SFU at RMU at 6pm, is another rematch of last year’s championship game. While this game won’t have any impact on the Colonials in the standings (their place at the top spot is already locked in), it could serve as a tremendous confidence boost going into the tournament. RMU will be looking to rebound after a disappointing 54-45 defeat at Sacred Heart on Monday night, and they will be looking to avoid taking a two game losing streak into the NEC Tournament. Meanwhile, the Red Flash have plenty at stake, as a win would assure SFU of the #3 seed, and thereby avoiding having to play the Colonials again until the Championship Game round. The remaining four games will all tip at 7pm. The Wagner at Bryant game holds significant interest, as the Bulldogs can wrap up the five spot with a win, however a Bulldog loss and all eyes will turn to Emmitsburg to see if the Mount or Wagner jump up to the five. The Knights play their regular season finale on their home court against LIU Brooklyn, controlling their own destiny. A win and the Knights are in the tournament, however the Blackbirds, playing in their final game of the season, will look to play spoiler and take some momentum into the 2019-20 season. THREE: Amy O’Neill, SR (SFBK): It was quite the weekend for our featured player in this week’s Fast Break column, as the Terriers rebounded from being swept last weekend in Pennsylvania, to recording a sweep of their own back on home soil against Bryant and Mount St. Mary’s. O’Neill’s weekend started by being honored at the Terrier’s Senior Day ceremony on Saturday, which included the special moment of getting escorted out by her mom, who flew halfway around the globe from Australia to be there in person. O’Neill scored a career high 28 points on 8 for 10 shooting, and a perfect 4 for 4 from downtown, to go with 6 rebounds, 9 assists, and 2 steals. On Monday night, once again, the ‘triple-double alert’ was in full effect, as O’Neill finished with 10 points, 8 rebounds, 9 assists, and 2 steals. The pair of wins helped secure a first round playoff home game for the Terriers in the upcoming NEC Tournament. TWO: Sydney Holloway, JR (BRY): With the Bryant Bulldogs in the midst of a big game on Monday night at LIU Brooklyn, in regards to their playoff positioning, they needed to get a big game from their top player. Holloway delivered, with a season high and a career high-tying 29 points to go with 9 rebounds, falling just shy of her 18th double-double of the season. Holloway had managed to pick up a double-double two days earlier, 19 points and 10 rebounds, in a loss to St. Francis Brooklyn. From January 28th through February 16th the Bulldogs took a tumble down the standings, dropping five games in a row. During that stretch, Holloway averaged 16.4 points and 10 rebounds. In the five games since, where Bryant has won four out of the five, the Bulldog junior has been on a scoring surge, averaging 20 points per game. ONE: Katherine Haines, GR (SHU): With the Pioneers fielding a thin roster due to injuries, Haines stepped up this week with a pair of double-doubles to help lead Sacred Heart to a sweep of the Keystone State clubs and help boost her late season run towards a potential ‘Player of the Year’ honor. On Senior Day, Saturday against Saint Francis, Haines made a ton of noise with 18 points and 15 rebounds, in a head to head showdown with Jess Kovatch, another top Player of the Year candidate. On Monday, after being limited to just 7 points on 2 for 10 shooting in the first go-around against Nneka Ezeigbo and Robert Morris, Haines turned the tables with a 15 point and 11 rebound outing. Haines now has recorded a total of 13 double-doubles on the year. Since their three game skid in late-January into early-February, the Pioneers have won seven out of their last eight games, with Haines recording numbers off the charts. Over her last eight games, the Sacred Heart grad student averages 18.9 points and 9.9 rebounds, with a 55.8% shooting percentage, including 51.9% from three point range. *Mount St. Mary’s holds the NEC record for most all-time appearances in the 33-year history of the NEC Women’s Basketball Tournament. This season, Mount will be making their 27th tournament trip, returning to the postseason after missing out by a single game last year. The Sacred Heart Pioneers have been to the NEC Tournament 20 straight seasons, every year since they joined the NEC. The Saint Francis Red Flash are the reigning NEC champions, and hold the record with 12 overall tournament titles. Thank you to Linda Cimino, Amy O’Neill, and Monique LeBlanc for taking the time to chat with us for this week’s column. Our NEC WBB post-season coverage tips off on Friday, March 8th for a special quarter-final playoff edition of the NEC WBB Fast Break column. We’ll recap the final day of the regular season, preview all four quarter-final playoff matchups, look back at the five year anniversary of the epic 2014 quarter-final playoff game between Saint Francis U and Sacred Heart, and highlight 2019’s top award candidates. Be sure to follow us all post-season long on the road to the 2019 NEC Women’s Basketball Championship here on the NEC Overtime! Blog. On Monday, February 18th, ESPN3 and NEC Front Row aired the Robert Morris Colonials and Saint Francis Red Flash women’s basketball game live from DeGol Arena in Loretto. The matchup, a rematch of the previous season’s championship game, was one of the most eagerly anticipated contests in the league’s 2019 women’s basketball broadcast package. As fans tuned in to see the Colonials come away with a 66-60 victory over their Keystone State rivals, not many know the process for how a NEC basketball broadcast comes together and gets on the air. So this week in the NEC Overtime! Blog we wanted to do something a little different. Let’s pull back the curtain and let you, the audience, in on the preparation involved leading up to the game, the gameday production, the crew that helps make the broadcast possible, and reveal some of the production decisions along the way that helped shape what you saw on the screen. The following is an exclusive behind the scenes account of February 18th’s Colonials/Red Flash ESPN3 broadcast…this is NEC-TV All-Access! From a play-by-play announcer’s perspective, preparing for a game is just like preparing for an exam in school. If you don’t open up a textbook until the night before to start studying, you probably aren’t going to fare that well on the test. So on this day, eight full days before gameday, I would get started on my preparation, spending time updating my SFU and RMU charts. All broadcasters have some sort of chart in front of them when they call games. These charts come in all different variations: hand-written or typed, simple or fancy, black and white or color coded, etc. Whatever is easiest for the announcer to follow. These charts will usually include basic information such as player names, numbers, stats, and notes. For me, I create my charts through Microsoft Word, so this way I don’t have to re-write every single note by hand every single time I see a team, I can just copy and paste or cut out and add. For example, the last time I saw Robert Morris and Saint Francis was last year’s championship game, so my RMU and SFU charts were still set up from last March. So I had to sadly take out players from last year such as Ace Harrison and Megan Smith, and update the charts with the current rosters and 2019 information. My broadcast partner Pam Roecker hand writes her notes about each player. As the analyst, her notes include more scouting report type information and notes from her conversations with the coaches, while my notes are more fun facts, stories, and statistics. One week before gameday, Bryant plays at Saint Francis and Robert Morris hosts Central Connecticut State on NEC Front Row. I have my updated roster charts out so now I can practice identifying players as I watch the games. In Loretto, the Red Flash won their fifth in a row 78-66, while the Colonials improved to 11-0 with a 60-40 win in Moon. From these games, I also start to take note of any storylines that might be prevalent for next week’s broadcast, for example: Robert Morris chasing 2013 Quinnipiac as the last team to have an undefeated NEC season, Courtney Zezza approaching the school’s career blocks record, Robert Morris’ post-players (34 points in the paint vs. CCSU) vs. SFU’s new zone defense, and Jess Kovatch on fire, averaging 28.8 points per game over the previous three weeks. Tuesday was a snow day in New Jersey, so I got a chance to complete a lot of work in my game prep. I went back into my charts, updated the stats to include the numbers from Monday night’s games, and completed adding extra notes on each player in the notes boxes. Among the notes added to my charts include Isabella Posset not only being RMU’s first local product since 2013-14, but also wearing #4. The last two scholarship players to wear #4 – Anna Niki Stamolamprou and Angela Pace – won Player of the Year honors. Also, I found stories on Karson Swogger’s late grandfather being a former Hall of Fame coach at Altoona High School and teaching her the floater, Haley Thomas coming back from a foot injury last year to be in running for Most Improved Player this year, and finally a story on Swogger and Thomas being former high school opponents and playing a playoff game against each other at DeGol Arena. While there’s no guarantee how many of these stories, if any at all, make it into the actual broadcast, I like to research and have as many as I can, just in case. I went back to NEC Front Row and watched last year’s Robert Morris/Saint Francis game. I tried to pay close attention to how Robert Morris defended Jess Kovatch. I noticed they used multiple players starting with Jocelyn Jones and then Nina Augustin for a good majority of the game. It didn’t help, as Kovatch lit up the Colonials with six threes in the third quarter. Watching back last year’s game also sparked the idea to research Kovatch’s career numbers against Robert Morris (25.4ppg on 42.3% shooting in seven games) and career numbers on ESPN3 NEC games (28.1ppg on 44.7% shooting in ten games). 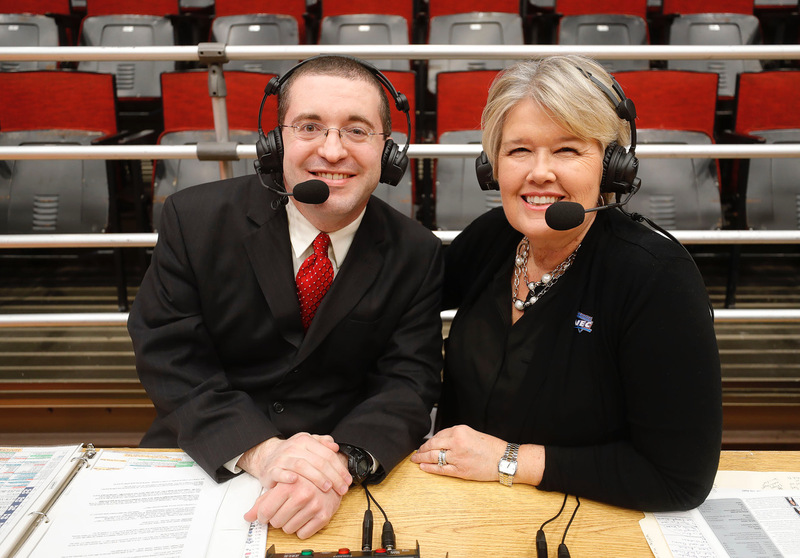 During the remainder of the week, my broadcast partner Pam Roecker and I will be in touch either through e-mail or over the phone (for this particular week it would be via e-mail), and we exchange ideas for storylines or important things we would like to bring up on the broadcast. Storylines Pam suggested for this week include: Kovatch as the all-time leading scorer and all of the post-season honor watch-lists she is on, Susan Robinson-Fruchtl serving as interim head coach while also the Athletic Director, and how Robert Morris would respond back in the building where they lost the championship game a year ago. I head up to Hackensack to see Saint Francis play against Fairleigh Dickinson. It’s my first time seeing the Red Flash in person since the last time they came to New Jersey, in their season opener against Rutgers. Before the game, I get to chat for about 10 minutes with interim head coach Susan Robinson Fruchtl. On Sunday, Pam and I hear from our production director Brad Kasnet from Pack Network for a ‘production meeting’ of sorts. Pam and I submit our players who we would like to feature during the opening of the broadcast (Nneka Ezeigbo for RMU and Jess Kovatch for SFU). We also suggest to Brad opening the broadcast with a graphic of the NEC standings and having a camera gather footage from the pre-game ‘Courtney Zezza Block Party’ in front of DeGol Arena to use either in the open or at some point during the broadcast. We go over some stats that could be made into graphics, such as the numbers I found earlier in the week on Kovatch against Robert Morris and Kovatch in NEC ESPN3 games. Brad then sends us a copy of the rundown, which lists the sequence for the game open and all of the commercial breaks during the game, with the promos that I have to read at each break. Monday, February 18th – GAMEDAY! After over a week of studying and preparation, gameday is finally here! 10:30am: The Pack Network crew, composed of production director Brad Kasnet and production assistant/camera operator James Kent, arrive at DeGol Arena. Once the game actually starts, they will be joined by three other camera operators, a graphics operator, and a TV timeout coordinator who is on the phone with ESPN counting down to and counting back from commercial breaks. Brad and James will spend much of the morning and afternoon setting up their equipment, a process that takes at least four hours. They run cables, setting up the cameras, microphones, and monitors, connecting everything to the main computer console. Brad will use this console to direct the game (play the commercials, cut to the various camera shots, show replays, and post graphics). They establish feeds to the monitors at the broadcast position and the video board in the gym, and make sure the feed is properly transmitting to NEC Front Row and ESPN. Brad will then spend much of the afternoon creating all of the graphics that you see on the screen during the game. 5:00pm: About two hours before the start of the game, Pam and I arrive at DeGol Arena. We meet with Brad and go over the graphics and the rundown. One adjustment that needed to be made is changing the NEC standings graphic to include the three games that went final earlier in the afternoon. St. Francis Brooklyn winning and clinching a playoff spot and Sacred Heart’s loss to LIU Brooklyn both had a direct impact on our game, considering now SFU would have a chance to go one full game up on the Pioneers and Terriers, so that definitely needed to be reflected in the standings graphic. 5:30pm: Red Flash head coach Susan Robinson Fruchtl came over to say hello to Pam and I at the broadcast table. Part of our informal conversation involved Coach Robinson Fruchtl telling us that at halftime the SFU bowling team would be receiving their championship rings after winning the 2018 NEC Championship. With a feature on NEC Hall of Fame bowler Danielle McEwan already scheduled for our halftime show, the decision was made to show part of the ceremony coming out of the feature piece and before going to commercial break. 6:00pm: Robert Morris SID Ethan Woy comes over to talk to us briefly about the Colonials, going over who is available and who isn’t and discuss some name pronunciations. Anyone who has followed any of my broadcasts, or regularly reads this column, knows that I like weird and quirky stats. We find out that Robert Morris is wearing their pink jerseys for this game after originally being listed to wear their road navy blues. RMU is 22-1 all time when wearing the pink jerseys, information that wasn’t originally planned to get on the broadcast, but now definitely will. James from Pack Network goes outside with a camera to film the opening shot of DeGol Arena and record footage of students flipping burgers and hot dogs on the grill as part of the ‘Block Party’ while light snow flurries start to come down. James then returns inside and uploads that footage from the camera into Brad’s main computer to use during the broadcast. After looking through the rundown, Brad and I see that there is time coming back from commercial at the second quarter media timeout, after we read the ‘NCAA Respect’ promo, to show the ‘Block Party’ footage. 6:30pm: About a half-hour before going on the air, Pam and I rehearse the opening to the broadcast. We run through everything that you will see on TV. The opening starts with the shot recorded from outside DeGol Arena, then cuts to a wide shot of inside the gym while a graphic comes up with the team’s logos and records. Then comes the NEC standings graphic we decided to add to the open earlier in the week, before finally the camera cuts to Pam and I courtside. I set up Pam to talk about the rivalry and these two teams meeting for the first time since last year’s championship, before setting up the starting lineups and our feature players, Ezeigbo and Kovatch. Everything to that point goes according to the script and we are all ready to roll! FIRST QUARTER: We go live on the air and run through the opening just as we rehearsed. For ESPN3 games, the official game start time is 7:03 or 7:04pm. It can be an awkward situation for the players and the fans in the building as they already ran through the anthem and lineups before ESPN3 goes on the air at 7:00, but the game doesn’t actually start until a few minutes after the hour so we can set the scene with our opening and run through the starting lineups on the broadcast. So everyone on the court and in the stands is all pumped up and excited to get going, only to have to stand around and wait for several minutes so us TV people can finish up our stuff. Here is an example of how the pre-game prep pays off during a broadcast: at the 6:26 mark of the first quarter Karson Swogger is fouled trying to put up a floater in the lane. While she is taking her free throws, it’s a perfect time to draw back to the story I researched on Tuesday on Swogger’s grandfather teaching her the floater. Pam then would transition from that to bringing in notes from her conversation with Coach Robinson Fruchtl earlier in the week about Swogger transitioning to a point guard role this year. SECOND QUARTER: Sometimes things fall into place with the perfect timing, as was the case with the second quarter media timeout. We had pre-determined before the game that we would be coming out of this break with the footage from the ‘Block Party,’ and sure enough, Zezza recorded four blocks in the first five minutes of the second quarter to bring her total up to five for the game. So coming out of the commercial, viewers saw the shot of the burgers and hot dogs on the grill while I read the NCAA Respect promo, and then Pam and I were able to discuss Zezza’s shot blocking skills. HALFTIME: As planned, we go from the Hall of Fame video package of Danielle McEwen right into a live shot of the Saint Francis bowling team getting honored. With Kovatch held to just three points, Pam checks in with SFU SID David Halstead to see if the three points were Kovatch’s lowest in a half this season (they were) and to check what her season low point total is. At his computer, while the halftime features and commercials play, production director Brad is searching through replays saved onto his computer of the top plays from the first half to put together for a ‘first half highlights’ segment, all while updating the ‘halftime stats’ graphic. THIRD QUARTER: In the third quarter, the broadcast conversation started to shift into focusing on the RMU defense. With 5:02 to go, following Pam’s analysis on how Augustin used an angle to force Kovatch out of the paint while she was in transition, I brought out a quirky statistic from the RMU game notes about how the Colonials had held five straight opponent’s leading scorers to single digit scoring. FOURTH QUARTER: During the commercial break, I researched the season high in three point attempts for Robert Morris. They had 28 three point attempts at the end of the third quarter, only the fifth time they had as many as 28 or more during a game this year, a note we got across in the opening 30 seconds of the fourth quarter. With 7:43 remaining, Kovatch and Nia Adams get tangled up and both fell to the ground while going after a rebound. In a perfect example of the behind-the-scenes communication between the director and the on-air talent during a broadcast, the initial live shot saw Kovatch and Adams get tangled up, the whistle blow, and then a cut to the baseline camera view where you saw Kovatch get helped up by her teammates, before finally going back to the wide camera to see that Kovatch had a ‘flat tire’ situation with her sneaker where her shoe partially came off. While all this sequence was going on, production director Brad was talking to me in my headset, telling me that they had a replay of her from the baseline camera pointing and showing her ‘heel situation.’ So Brad cut right to that replay and Pam and I were able to react and comment. With under 4:00 minutes to go, and the game in a timeout, Pam and I start discussing the jersey ceremony from the week before of NEC Hall of Famer Jess Zinobile. Brad communicates to the baseline cameraman to turn around and secure a shot of Zinobile’s jersey just to the right of the scoreboard, allowing Brad to cut to a shot of the jersey as Pam and I were in the middle of our Zinobile conversation. Coach B had told Pam on Sunday night that one area the Colonials needed to improve on, going back to several instances in non-conference, but especially after Mount two days earlier, was closing out games. With RMU protecting a three point lead in the final minute, suddenly that piece of information became front and center. POSTGAME: After the Colonials secured the 66-60 victory, the last order of business on the broadcast was Pam interviewing the winning coach and the player of the game. As Pam made her way from the broadcast table over to the sideline camera for the interview, she meets up with RMU SID Ethan Woy to discuss which player she would be interviewing. It came down to either Augustin (18 points on 6-12 3pt shooting) or Ezeigbo (16 points and 9 rebounds), and the decision was made to go with Augustin. Following the interview, I got the ‘wrap-it-up’ signal from Brad through my headset, and we went through the game ending narration while Brad rolled back highlights from earlier in the game, as we said ‘goodnight’ and signed off the air. Be sure to join us for the next NEC Women’s Basketball broadcasts on ESPN3 coming up this post-season. ESPN3 will air both 2019 NEC Women’s Basketball Tournament semi-final matchups on Thursday, March 14th at 7pm. *WHERE THEY STAND: Three more teams entered the 2019 NEC Women’s Basketball Tournament field this weekend as the Wagner Seahawks clinched their first playoff berth since 2014 with a 60-44 win over Fairleigh Dickinson on Saturday afternoon, while Mount St. Mary’s and Bryant punched their tickets with wins on Monday night coupled with losses by CCSU, Fairleigh Dickinson, and LIU Brooklyn. The Robert Morris Colonials maintained their lead in the top spot in the NEC standings by sweeping the NEC’s Brooklyn institutions, winning on Saturday over St. Francis Brooklyn 74-57, and again on Monday night over LIU Brooklyn 71-54. Sporting a three game lead with three games left to go, the Colonials have clinched at least a share of the NEC’s regular season championship for a third straight year and for the seventh time overall. RMU can clinch the title outright, and the tournament’s #1 seed for a fourth time in program history, with one more win or one more Sacred Heart loss over the final three games of the regular season. Sacred Heart was shorthanded for most of the weekend, but picked up two of their biggest wins of the year on the road, a 27 point win on Saturday at Central, and a 19 point win on Monday night at FDU. With the win on Monday against the Knights, combined with Wagner’s loss to Bryant, the Pioneers have clinched a top four seed and a first round playoff home game at the Pitt Center. The Pioneers trail RMU for the #1 spot by three games with three to go. They would need to win out, including a win next Monday head-to-head against RMU, and hope the Colonials drop their two other games as well, just to force a first place tie and leave it up to the tiebreakers to decide the #1 seed. Maintaining the #2 spot will be just as important, as finishing in second would ensure that any playoff games played in the first two rounds would be at home. Sacred Heart holds a one game lead over Saint Francis U for second, with the Red Flash set to come to town for a Saturday afternoon showdown this weekend. A Sacred Heart win would reduce the magic number to one to clinch a top two seed, while a Red Flash win would force a tie for second place, with SFU winning the season series to control the tiebreaker. Monday night also saw a tie for third place broken as the Saint Francis Red Flash defeated the St. Francis Brooklyn Terriers 86-84 in Loretto. Both teams entered the night tied for third at 9-5 in NEC play, but SFU’s win now gives them a one game edge. SFU’s win was crucial because it forces a split in the season series, which would be important for tiebreakers should these teams finish the year even. As mentioned, the Red Flash can force themselves into a tie for second, with the tiebreaker advantage, if they can win on the road in Fairfield on Saturday. Saint Francis can also clinch a first round playoff home game with another win and another Wagner loss. For the Terriers, after dropping both games of the Pennsylvania road trip, they fall to fourth place with a 9-6 record in NEC play, one game behind third place and only one game ahead of fifth. St. Francis Brooklyn, looking to host their first playoff game in school history, will need to maintain their slim margin over Wagner. The Seahawks and Terriers split their season series this year, so any tiebreaker would come down to records against the NEC’s top teams in the standings. The Terriers own an overtime victory over the current second place Pioneers, but the Seahawks will have an opportunity when they host Robert Morris and Saint Francis this weekend. The Seahawks clinched only their program’s fourth playoff appearance in the last 15 years on Saturday. They are looking to host a playoff game at the Spiro Center for the first time since 2004. Mount St. Mary’s and Bryant both locked up playoff spots this weekend. Mount St. Mary’s returns to the playoffs in 2019 after missing out last year in Coach Marchesano’s first season. Bryant has been to the postseason every year since first being eligible in 2013. The Bulldogs hold the head-to-head tiebreaker advantage over Mount due to a sweep in the regular season series. Finally, three teams are in the running for just one final playoff spot, as Central Connecticut, Fairleigh Dickinson, and LIU Brooklyn head into the final three games deadlocked in the standings. At the moment, FDU holds the advantage in a three way tiebreaker situation due to a 2-0 combined record against LIU and CCSU so far this season. While the Blackbirds are in a bit of a hole with an 0-2 combined record against the other two teams, they have thrust themselves back into the race with recent wins over two of the league’s top three teams, Sacred Heart and Saint Francis U, wins that could be a huge advantage if all three teams end up tied in their head to head records against each other. What will make this a fascinating race to the finish line, is that all three of these teams face each other over the final week, starting with CCSU at LIU Brooklyn on Saturday, Fairleigh Dickinson at CCSU on Monday, and then LIU Brooklyn at Fairleigh Dickinson in the regular season finale on Thursday, March 7th. *SHU SHOOTING DISPLAY ON ESPN+: The Sacred Heart Pioneers put on quite the shooting display in front of an ESPN+ audience on Monday night in Hackensack, NJ. The Pioneers shot a single game, team Division 1 record 28-46 from the floor (60.9%), and shot 14-25 from behind the arc, leading SHU to an 82-63 victory over the Fairleigh Dickinson Knights. The 82 points and the 14 threes marked season highs for Sacred Heart. Four Pioneer players were in double-figure scoring, led by Kat Haines with 22, Erin Storck with 16, Candice Leatherwood with 12, and Jayla Davis with a career high 19. Playing without two regular starters, Davis began the night in the starting lineup for the first time this year, while grad student Kiana Ye saw extended minutes in just her second game of the season. Ye, who returned to action for the first time since last year’s postseason on Saturday against Central Connecticut State, played 19 minutes and connected on three triples, leading to a career high nine points. The game broke open with a 32 point third quarter for Sacred Heart, where they shot 10-13 overall and 6-7 from behind the arc. The 32 point quarter was the highest scoring quarter in program history. *Sacred Heart hosting Robert Morris and Saint Francis U: In a pair of games that will likely shape the top three spots in the NEC Tournament, Sacred Heart will welcome RMU and SFU into the Pitt Center this weekend. The Pioneers, winners of 11 out of their last 12 NEC home games, return to the Pitt Center for the first time since February 11th, after going 3-1 on a season long four game road trip. Robert Morris needs only one more win or one more Sacred Heart loss to officially wrap up the number one seed, while Saint Francis and Sacred Heart battle for a possible top two seed. The Pioneers and Red Flash will meet one week shy of the fifth anniversary of their historic 132-124 double overtime playoff game from back in the 2014 season. *The Race for Eighth: All three teams currently tied for the eighth and final playoff spot will play each other over these final three games, beginning this week with Central Connecticut State at LIU Brooklyn on Saturday and Fairleigh Dickinson at Central Connecticut State on Monday. THREE: Haley Thomas, SO (SFU): The Saint Francis sophomore had a career night in Monday’s victory over St. Francis Brooklyn. Thomas poured in a career high 27 points on 12 for 18 shooting. “They had no answer for Haley,” said interim head coach Susan Robinson Fruchtl in the post-game press conference. “They had no answer inside, outside…whoever they put on her was just a mismatch.” In Saturday’s loss to the Blackbirds, Thomas came off the bench due to SFU starting their seniors for Senior Day, and the Hooversville, PA native contributed 12 points, 6 rebounds, 4 assists, and 3 steals in 29 minutes before fouling out. On the weekend, Thomas was super-efficient, shooting 68% from the field over the two games. TWO: Katherine Haines, GR (SHU): The Sacred Heart Pioneers have won five out of their last six games over the last three weeks, and during this stretch, graduate student Kat Haines has been what her head coach Jess Mannetti describes as ‘unstoppable.’ The numbers back that claim up, as Haines has averaged 19.8 points, 8.8 rebounds, and has shot 59.2% during the last six outings. This past week, Haines recorded her 11th double-double of the season on Saturday with 24 points and 12 rebounds against Central Connecticut, and then followed it up with 22 points, 5 rebounds, and a career high 5 assists against Fairleigh Dickinson. *Jade Johnson and Nneka Ezeigbo both hit the 30 point mark in the scoring column on Monday night. Their performances became the 14th and 15th individual 30 point games of the season in the Northeast Conference, making 2018-19 a season with the most individual 30 point games since 22 were recorded in 2015-16. St. Francis Brooklyn’s Jade Johnson has recorded the most individual 30 point games on the season with five (and three in her last five games), ahead of SFU’s Jess Kovatch who has three. Be sure to join us back here at the NEC Overtime! Blog next Wednesday, March 6th for the regular season finale of the WBB Fast Break column. We’ll break down all of the tiebreaker scenarios going into the final games and look ahead to the 2019 NEC Tournament! That was Wagner head women’s basketball coach Heather Jacobs back at NEC’s Social Media Day in October answering a question from former Seahawk head coach Pam Roecker as to whether or not she thought this was the year the Seahawks could make the jump back into the NEC’s postseason for the first time since 2014. Jacobs’ team had just been selected last in the annual coaches’ pre-season poll, an unfortunately familiar place for Wagner women’s basketball, as the program had ended up at the bottom of the standings in each of the last four straight seasons and six out of the last seven. But this year is proving to be different. Something special is in the process of happening on Staten Island as the Wagner College Seahawks are beating the odds, the prognostications, and a lot of other NEC teams as well. The Seahawks have surged out to a 7-6 start, their best NEC record after 13 games since 2004. How long has that been? Well, consider that in February of 2004 the iPhone didn’t exist, Facebook was only weeks old, many of the current group of players were in preschool or kindergarten, and Coach Jacobs was halfway through her college playing career at Franklin Pierce. With a win on Saturday against Fairleigh Dickinson, Wagner would secure their first playoff berth since 2014 and only their fourth playoff appearance over the last 15 years. Wagner was once a very strong and very proud basketball program in the late 80’s, throughout the 90’s, and into the beginning of the new century. Wagner was an original NEC women’s basketball institution, and for the first 18 straight years, they were staples in the women’s basketball tournament. During that 18 year stretch from 1987-2004, the Seahawks were coached by Gela Mikalauskas (1979-90), Pam Roecker (1990-98), and Tara Gallagher (1998-05). They would reach the tournament semi-finals nine times and appear in four NEC Championship Games. The crown jewel would come in 1989 under Mikalauskas, when league MVP Maureen Coughlin paced the team to a 22-win campaign and a 66-60 victory over Robert Morris in the final, to earn the program’s first and only NEC Championship. From 1996-2003, under Roecker and Gallagher, Wagner would go on a run of eight straight seasons of double-digit conference wins. The 87 wins during that period was third best in the league behind only NEC super-powers Saint Francis U and Mount St. Mary’s. In the middle of an era where Saint Francis and Mount St. Mary’s were dominating the league, the Seahawks were able to hold their own and be perennial contenders. Both Roecker and Gallagher agreed that the key was in the players they recruited to the program, some of the school’s all-time greats, such as Nia Ryan, Amanda Young, Susan Moffat, Meredith Kearns, Carrie Walker, Joy Gallagher, Patti Winterfeldt, and Brenda Milano. In 2004, the team finished 8-10, a down year by their standards, but still enough to qualify for the NEC tournament as the number six seed. The team was slowed by the loss of their All-Conference senior Carrie Walker. Walker missed 11 conference games in January and February due to injury, where the team went 4-7. Walker returned right before the start of the playoffs, but the Seahawks were upended on their home court by the Monmouth Hawks. “We were picked to be pretty good that year, and although we did okay, it wasn’t, obviously, the year we wanted to have,” recounted Gallagher. Following that season, Wagner lost a ton of firepower, including three starters: Walker, Vanessa Wyffels, and Ashley Linscott, which equated to 40% of their offense. In 2005 the Seahawks would finish 2-25 and 2-16 in NEC play, missing the NEC Tournament for the first time ever. “It was hard, it was tough, but the kids still worked hard. Your heart breaks for the kids more than anything,” said Gallagher. Enter Heather Jacobs, who was hired in April of 2016 as the program’s ninth head coach. Jacobs was no stranger to turning around programs. In 2007-08 she took over a Daniel Webster program that won only 10 games in her first season, finishing 2-11 in conference. By year three, the Eagles won 20 games, were 15-1 in conference, and regular season champions. Jacobs would then head to Adelphi where it would be a similar story. The Panthers finished in 14th place during her first season, but would end up 14-5 and make the Northeast-10 playoffs in her third campaign. In her office, underneath her desk, Coach Jacobs has a wall of bricks. Bricks decorated in the official Seahawks colors: green, black, white, and silver. Written on the bricks are team and individual accomplishments dating back to her first season on Staten Island. Accomplishments such as Team GPA’s, Rookie and Player of the Week honors, and Jacobs’ first NEC win, 58-45 over St. Francis Brooklyn back in January of 2017, just to name a few. The brick wall symbolizes building the program, brick by brick, while recognizing the key moments along the way. For the current group of Seahawk players, it isn’t about dwelling on the past or a 14 year ‘losing culture’. No player was a part of the roster prior to Coach Jacobs’ arrival, so to them, the only things they know and that matter are the steps of progression made over the last three years, or in other words, the bricks that they’ve had a hand in building. Following our sit-down interview for this feature, Coach Jacobs handed Simmons a blank brick for the Melbourne native to mark to recognize her recent Player of the Week honor. It will be the latest brick to be added to Coach Jacobs’ wall as the Seahawks continue their process of building themselves back into contention in the NEC. The Wagner Seahawks will have a chance to clinch their first playoff appearance since 2014 with a win on Saturday at Fairleigh Dickinson. If Wagner can pick up two more wins over their final five NEC games, they will assure themselves of their first .500 season in conference play since 2003. *WHERE THEY STAND: Half of the 2019 playoff field has been decided, as Saint Francis U, Sacred Heart, and St. Francis Brooklyn all clinched playoff spots this past weekend to join Robert Morris in the 2019 NEC Women’s Basketball Tournament. The Colonials suffered their first league setback on Saturday, falling to Mount St. Mary’s 61-55 in Emmitsburg. But RMU would manage to rebound on the road in Loretto two days later, winning a rematch of last year’s NEC Championship Game against the Red Flash 66-60. With the win, Robert Morris maintains a three-game lead over second place in the race for the regular season championship and the tournament’s #1 seed. With another win or a Seahawk loss, the Colonials can wrap-up a first round home playoff game in the North Athletic Complex, a place where Robert Morris has defeated their last 21 straight conference opponents. The reigning NEC champion Saint Francis Red Flash assured a return trip to the postseason for a 24th time, and 10th time in the last 11 years, with a 77-65 win in New Jersey over Fairleigh Dickinson on Saturday. The win coupled with the Colonial loss had the Flash in a position where they controlled their own destiny. Had they defeated RMU on Monday they would have been one game back with still another game against the Colonials to go, putting them in the driver’s seat in the race to the #1 seed. Instead, SFU now find themselves three games out of first and in a battle for the #2 seed. Sacred Heart will be appearing in their 20th straight NEC Tournament, the longest active streak in the NEC. They opened up a season long four game NEC road trip by splitting a pair of games against Bryant and LIU Brooklyn. Meanwhile, the St. Francis Brooklyn Terriers took advantage of losses by Saint Francis and Sacred Heart, returning into a three-way tie with the Pioneers and Red Flash for second place. By sweeping their games against the Blackbirds and Blue Devils, the Terriers officially wrapped up their third straight playoff berth and 14th in school history. The Wagner Seahawks, winners of four out of their last five, fell a game off of the pace for a top four spot and a first round home playoff game position after splitting games against Central Connecticut State and Mount St. Mary’s. At 7-6, the Seahawks own a winning record after 13 NEC games for the first time since 2004 and have a hold on sole possession of fifth place. After four straight years of finishing in last place, and predicted to finish last by the NEC coaches again this season, Wagner’s magic number to clinch their first playoff spot since 2014 is down to one. Mount St. Mary’s made up some lost ground this weekend by knocking off previous NEC unbeaten Robert Morris and following that up by handing the Wagner Seahawks their first defeat in the month of February. The Mountaineers are one game behind Wagner and two games out of the top four. The Bryant Bulldogs stand at 5-8 and in seventh place with a big game against the team directly above them, Mount St. Mary’s, coming up on Saturday. The bottom of the standings certainly got more interesting this weekend following LIU Brooklyn’s 69-64 win at the Barclays Center over Sacred Heart. After starting the year 0-10 in league play, the Blackbirds have won two out of their last three and are only one game behind Central Connecticut State and Fairleigh Dickinson for the eighth and final playoff spot. In fact, the Blackbirds will play both the Blue Devils and Knights during the final week of conference play, games that could have major implications as to who makes the postseason and which two teams will be left on the outside looking in. *KEYSTONE STATE COLLISION: 345 days after meeting at DeGol Arena to decide the 2018 NEC Championship, the Robert Morris Colonials returned to Loretto for the first time since last March to take on the reigning NEC champion Saint Francis Red Flash. The game would come down to the fourth quarter and see the Colonials outscore SFU 11-4 over the final three minutes to come away with a 66-60 victory, their 12th win in their last 13 games. The game featured several eye popping surprises, first of which was the RMU defense holding Jess Kovatch to a career low six points on 1-9 shooting. Kovatch, who had averaged 25.4 points on 42.3% shooting in seven prior career games against the Colonials, became the sixth straight opposing team’s leading scorer to be held to single digit scoring against RMU. The Red Flash, one of the top free throw shooting teams in the league, uncharacteristically left a lot of points off the board due to missed free throw opportunities, going 16 for 26 from the charity stripe on the night. Robert Morris also dominated the boards with a 48-34 advantage, and a 19-6 advantage on the offensive glass, leading to 17 Colonial second chance points. RMU also hoisted up a season high 39 three point attempts. Six of those three point attempts were successfully converted by sophomore guard Nina Augustin, leading to a career high 18 point outing. Nneka Ezeigbo finished a rebound shy of a double-double with 16 points and 9 rebounds. *HISTORY FOR THE DUO FROM DOWN UNDER: St. Francis Brooklyn’s ‘Duo from Down Under’ had themselves a weekend as the Terriers welcomed in LIU Brooklyn and Central Connecticut State for games at the Pope PE Center. On Saturday, senior guard Amy O’Neill recorded her second triple-double of the season with a 16 point, 10 rebound, and 11 assist afternoon against borough rival LIU Brooklyn. O’Neill recorded the lucky 13th triple-double in NEC history and joins RMU’s Chinata Nesbit from 2008 as only players in league annals to have multiple triple-doubles in a single season. All this coming just two weeks after O’Neill recorded her first triple-double, and the first in program history, with 13 points, 13 rebounds, and 12 assists in 44 minutes against Sacred Heart. The Melbourne native is one of only six players in the nation to have multiple triple-doubles on the season. Also during the game against the Blackbirds, an O’Neill dish to Johnson on a made jumper would give O’Neill the school’s single season assist record, which previously stood for 28 years. The senior’s tally now stands at 207 helpers, and counting, in 2019. Join us next week here on the #NECWBB Fast Break, where we will sit down and chat with the NEC’s Triple-Double Queen. Meanwhile, O’Neill’s tag team partner, Jade Johnson, was also busy making history of her own on Saturday afternoon, netting her 1,000th career point in the first half of the game against LIU Brooklyn. Johnson reaches the milestone as a junior, and becomes the 18th member of the St. Francis Brooklyn 1,000 point club, joining teammate Maria Palarino who eclipsed 1,000 points earlier this year at Mount St. Mary’s. Johnson and Palarino join Central’s Kiana Patterson, Bryant’s Sydney Holloway, and Sacred Heart’s Katherine Haines, as players who have reached 1,000 career points this season. With only five regular season games to go, plus any playoff games her team plays, Fairleigh Dickinson senior guard Madelynn Comly owns 958 career points, 42 shy of 1,000. Comly would have to average 8.4 points over the last five games to get there. *St. Francis Brooklyn’s Pennsylvania Road Trip: After last week’s loss to Wagner put them one game off of the pace for second place, the Terriers fought their way back into the pack with Sacred Heart and Saint Francis U by sweeping a pair of games against LIU Brooklyn and Central Connecticut. The Terriers chances for ending up with one of the tournament’s top seeds could very well rest on their performance in Pennsylvania this weekend against the Colonials on Saturday and Red Flash on Monday. St. Francis Brooklyn welcomed both of the NEC’s Pennsylvania institutions into Brooklyn back in mid-January and came away with a split. Robert Morris held the Terriers to just 56 points on 37.5% shooting, while forcing 19 turnovers in a Colonial 75-56 win, before SFBK bounced back 48 hours later with 78 points on 48% shooting in a 78-65 win over the reigning champion Red Flash, handing SFU their first conference loss of the season. Since the year 2000, the Terriers have never swept both games of the Pennsylvania road trip, however they have won at both Moon Township and Loretto in the same single season before. In 2015 they won at SFU and lost at Robert Morris during the regular season, but returned to RMU several weeks later and defeated the Colonials at the Sewell Center in the NEC Championship Game. St. Francis Brooklyn has already clinched a spot in the NEC Tournament for the third straight season and for the 14th time in program history, so now it is all about jockeying for position. The Terriers are battling to finish in the top four and clinch the program’s first ever home playoff game. A win in one or both of the games out in the Keystone State would go a long way to boosting their chances here in the waning stages of the regular season. *Sacred Heart at Fairleigh Dickinson: The Pioneers will travel to the Garden State to meet the FDU Knights on Monday night at the Rothman Center. The game will be broadcasted live at 7pm on ESPN+ with myself and Kim Adams on the call. 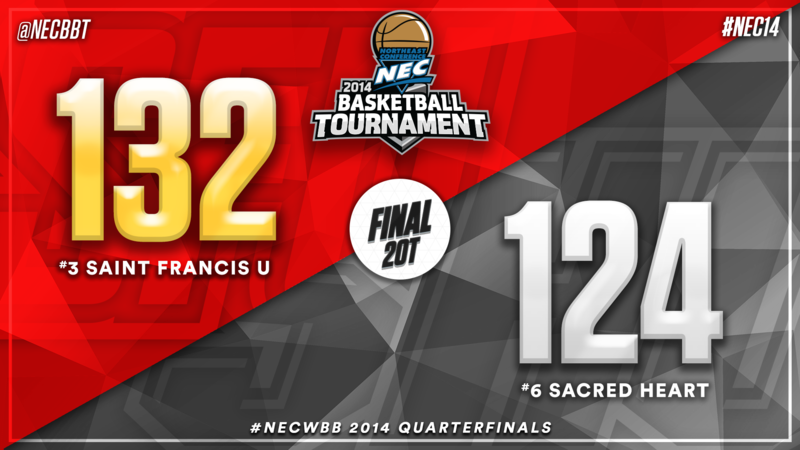 Sacred Heart is in a second place stalemate with St. Francis Brooklyn and Saint Francis U. The Pioneers would love to reach one of the top two seeds, which would ensure that a potential semi-final game would be played at the Pitt Center. The road to a postseason at the Pitt Center will ironically have to be earned on the road, as the Pioneers are in the midst of a season high four game road trip, playing five of their final seven regular season games on the road. Meanwhile, the Knights are fighting for their postseason lives. Fairleigh Dickinson has been to the NEC Tournament each of the last four seasons, with the last two years coming as the #8 seed. To make it back in 2019, the Knights will have to fight off both CCSU and LIU Brooklyn, in a situation where there are three teams likely battling for just one spot. The Pioneers and Knights met just two weeks ago in Fairfield with the Pioneers coming away with a 68-62 victory. SHU led by 18 points with just over seven minutes remaining, only to see the Knights stage a 19-4 run to pull within a single possession inside of two minutes to go. Sacred Heart managed to hold on for the win, led by Candice Leatherwood’s 19 points and Kat Haines’ double-double with 16 points and 10 rebounds. Sacred Heart has dominated the all-time series, sporting a 30-5 advantage. However, while the Pioneers are 18-0 all-time against FDU at home, they have tasted defeat four out of their last five trips to the Rothman Center. *The Mount/Bryant Rematch: In one of the most memorable NEC games of the year so far, Bryant staged an epic fourth quarter comeback at the Mount back on January 12th. Trailing by 11 points going into the fourth quarter, and by as many as 14 points within the final quarter itself, Bryant went on an 11-0 run to tie the game at 64 with 2:49 to play. The Bulldogs would outscore the Mountaineers 9-4 the rest of the way to pull off the improbable win, holding the Mount without a field goal for the final 6:09. It was a game that left Mount St. Mary’s frustrated that they let get away. Now six weeks later, they will meet in Rhode Island for the rematch, in a game neither can afford to lose. With just one game of separation between the two schools in the NEC standings, Bryant would be eliminated from top four, and first round home playoff game, contention with a loss, while Mount would slide down to seventh place and lose the head-to-head tiebreaker against the Bulldogs. THREE: Amy O’Neill, SR (SFBK): Two weeks after her first triple-double, and first triple-double in program history, O’Neill once again reached the historic milestone, this time in regulation. O’Neill filled up the stat sheet with 16 points, 10 rebounds, and 11 assists against the borough rival Blackbirds. O’Neill is one of just six players in the nation to have recorded multiple triple-doubles this season. Two days later, O’Neill would flirt with the mark once again, with an 8 point, 8 rebound, and 8 assist game against Central Connecticut, helping the Terriers to clinch a third straight trip to the NEC Tournament. The senior point guard is the only player in the NEC to rank top 20 in scoring and top 10 in assists and rebounds. O’Neill also stands second in the nation in assists per game and 10th in minutes played. TWO: Nina Augustin, SO (RMU): Nina Augustin was our ‘Player of the Game’ during Monday night’s ESPN3 broadcast, and is now our #2 Star of the Week. The box score will show that Augustin had a career offensive night on Monday night against the Red Flash, with a career high 18 points on six made threes. However, what the box score won’t necessarily show is her outstanding effort on the defensive side of the ball. Augustin played a large hand in the Robert Morris defense limiting the nation’s eighth ranked scorer, Jess Kovatch, to just six points on 1-9 shooting, the lowest single-game point total of her career. The sophomore from Finland started both games this weekend, making her first appearances in the starting five since December 7th against Kent State. ONE: Jade Johnson, JR (SFBK): Johnson had a historic weekend with her family in town all the way from Australia, pouring in a total of 52 points over the course of games against LIU Brooklyn and Central Connecticut State. Included in the 52, was her 1,000th career point, scored during the second quarter of Saturday’s showdown with the Blackbirds. Johnson would finish the day with 31 points on 13-21 shooting, making it the fourth time this year she has reached 30 points in a game, and the second time this year she’s done it against LIU Brooklyn. Also during that contest, Johnson would score the historic bucket that allowed Amy O’Neill to break the school’s single season assists record. Two days later, against the Blue Devils, the junior guard was right back at it. Johnson led the team with 21 points on 9-21 shooting against CCSU. On the season, Johnson ranks second in the league in both scoring and made threes. During the month of February, Johnson is averaging 22.6 points per game on 45% shooting and 39% from beyond the arc. *The greatest one-year turnaround in NEC history was the 2004 to 2005 Robert Morris Colonials. In their first season under Sal Buscaglia, the Colonials finished in last place, going 3-24 and 2-16 in NEC play during the 2004 season. Led by RMU Hall of Famer Sugeiry Monsac, the 2005 Colonials would go on to finish 17 games better overall and 11 games better in conference play, ending up a with a 20-10 overall and 13-5 NEC record, advancing all the way to the NEC Championship Game. A very special thank you this week to Wagner head coach Heather Jacobs, redshirt-sophomore Taylah Simmons, and former Seahawk head coaches Tara Gallagher and Pam Roecker for sitting down with us to talk about the great tradition and the current rise of Wagner women’s basketball. Be sure to join us back here at the NEC Overtime! Blog next Wednesday, February 27th for a unique WBB Fast Break column. First, we’ll check in with the NEC’s triple-double queen, St. Francis Brooklyn senior point guard, Amy O’Neill. Then, we will take you behind the scenes of the Saint Francis/Robert Morris ESPN3 broadcast from this past Monday night and show you what it takes to put on a basketball national broadcast. We’ll show you all of the preparation involved in the days leading up to the game. Plus we will give you a glimpse at the gameday production, meet the crew that helps make the broadcast possible, highlight some of the production decisions that helped shape what you saw on TV, and discuss what stories and information didn’t make the broadcast and why. After her first two seasons in a Mountaineer women’s basketball uniform, Juliette Lawless had very little to show for it. Sitting behind a very deep roster of talented guards, Lawless only played a total of 167 minutes during her freshman year, an average of less than seven minutes per game. As a sophomore, while her playing time doubled, Lawless didn’t quite have the freedom or the confidence she was looking for. As a result, with half of her Mount basketball career already behind her, not many people knew who she really was or what she was truly capable of. Finally last season, with a new head coach and a new appreciation for the game she loves, Lawless burst onto the scene in a big way, winning the 2018 NEC Most Improved Player award and getting selected to the All-NEC third team. The jump from her sophomore to junior year included a seven point improvement in scoring average (up to 11.1 points per game), an increase from 15 minutes per game to 33, and a 46% shooting percentage, good for top 10 in the league. Self-described as a player who drives hard to the rim, almost completely finishes right (even when on the left), can spot up shoot, knock down the open three, and pass relatively well out of the paint, Lawless is currently in the middle of her most outstanding basketball season yet. She stands third in the league in scoring and field goal percentage and fourth in assists and three-point shooting. Her Mountaineers are 4-7 in NEC play, and will go into the final month of the regular season looking to book a return trip to the playoffs after missing out last season. Over these last two seasons, Mount basketball fans and Northeast Conference basketball fans have had the pleasure of watching the artist known as JuJu Lawless create masterpieces on the court on a nightly basis. However, it’s her signature work ethic which she hopes to be remembered for, and which she hopes to leave behind with her teammates, that could very well end up being her pièce de résistance in Emmitsburg. 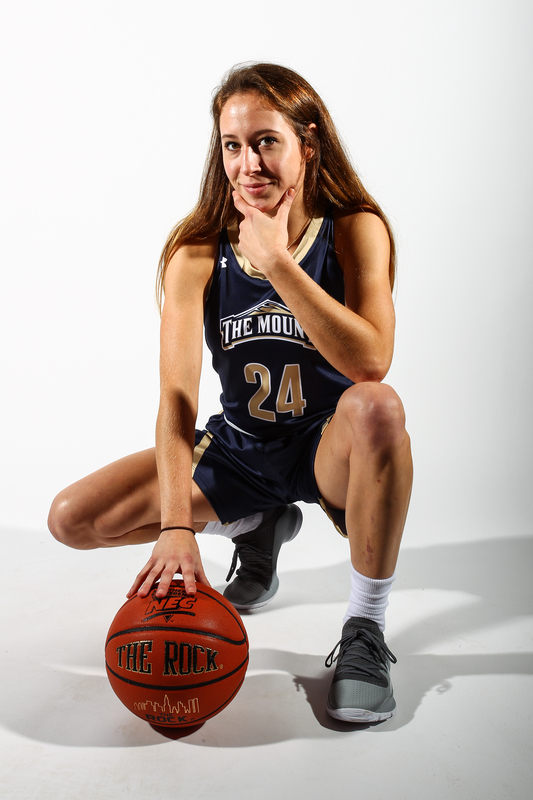 Mount St. Mary’s will hope to get Juliette Lawless back on court this weekend as the Mountaineers continue to make a push towards the postseason. The Mount returns home for games against two of the hottest teams in the NEC, Robert Morris on Saturday at 1pm and against Wagner on Monday at 7pm. *WHERE THEY STAND: The first ticket to the NEC’s annual playoff party has been punched as the Robert Morris Colonials officially clinched a spot in the 2019 NEC Women’s Basketball Tournament with wins this past weekend against Bryant (59-56) and Central Connecticut State (60-40). The Colonials are a perfect 11-0 in league play, their best start to a conference season in program history, and the fifth best start in league history, since the year 2000. This week RMU can tie, and perhaps surpass, the 2003 Red Flash, who started 12-0, for the fourth best start on that historic list. Their current 11 game win streak is tied for the third longest in the school’s record books. Just like they’ve been a mainstay atop the league standings this season, the Colonials have also practically been mainstays in the NEC Tournament. Robert Morris has now qualified for six straight, and 14 out of the last 15, NEC Tournaments. RMU has advanced to the championship game in each of the last five seasons, resulting in three tournament titles during this stretch. Up next, Robert Morris will hit the road for games at Mount St. Mary’s and Saint Francis U. RMU will have a chance to wrap up a first-round home game this weekend based on their own results, as well as outcomes from other games around the league. Sitting three games behind the Colonials are Sacred Heart and Saint Francis U. Both teams are 8-3 in NEC play and tied for second place. At the moment, the Red Flash hold the head-to-head tiebreaker advantage, but these two teams still have another game against each other coming up. SFU will have an opportunity to further their tiebreaker strength over Sacred Heart by securing a win over the NEC’s first place team, when they host Robert Morris on Monday. The reigning champions can clinch a playoff berth this weekend with a pair of wins, while the Pioneers can clinch their 20th straight postseason appearance with wins and some outside help. St. Francis Brooklyn’s 87-85 setback to Wagner dropped them out of the second place tie with Saint Francis and Sacred Heart, and into sole possession of fourth place. The Terriers are still in a ‘first round home game’ position, but now are only one game clear of the Seahawks. Wagner stands at 6-5, over .500 in league play after 11 games for the first time since 2003-04. After four straight years finishing in the basement of the NEC standings, Wagner has made a strong push forward in 2019, and find themselves in serious contention for a first round playoff home game. Wagner hasn’t hosted a playoff game since hosting the entire NEC Tournament quarter and semifinal rounds back in 2004. The Seahawks are looking to return to the postseason for the first time since 2014. Mount St. Mary’s, which has dropped its last three in a row, and Bryant, which has dropped four straight, have slid down the standings and into a tie for sixth place. Central Connecticut State and Fairleigh Dickinson remain tied for the eighth and final playoff position, while LIU Brooklyn, fresh off of its first NEC victory of the year, were able to make up some ground on Monday night, and now find themselves only two games out of the top eight. Episode 4: Who’s Got Game? After rd 1 Chenel Harris-Smith has a very slight lead on knowing her husband Sean Smith better than he knows her. *SHU BACK ON TRACK: Going into this past weekend’s games, the Sacred Heart Pioneers had gone from winning six straight to dropping three in a row. In speaking with Pioneers head coach Jessica Mannetti last week, in advance of Sacred Heart’s game against Mount St. Mary’s, she highlighted several areas that needed to improve: pace of play, shooting/scoring, turnovers, and rebounding. All of those boxes were checked, and then some, during SHU’s 76-41 victory on Saturday over the Mount on ESPN3. The Pioneers raced out of the gate at a blistering pace, shooting 15-27 and 8-13 from three, in the first half. They would finish the afternoon shooting 47% overall and 13-26 from downtown. The 13 made threes would set a new high-water mark for their most in a single game this season, and the 76 points would serve as the second most posted in a single game this year. The Pios also won the rebounding battle, 40-33, and committed fewer turnovers, 19-16. All five Pioneer starters finished in double-figures scoring. On the defensive end, Sacred Heart was able to lock down the third highest scoring offense in the NEC, holding Mount to 41 points and just 28% shooting. It was the fewest points allowed by the Pioneers since they allowed only 39 point to Central Connecticut State back in February of 2013. Just 48 hours later, Sacred Heart would keep the momentum rolling with a 68-62 win over FDU. The Pioneers would shoot 49% for the game, converting on 11 threes, which make a grand total of 24 triples for Sacred Heart over their last two outings. *BLACKBIRDS BACK IN THE WIN COLUMN: For the first time since December 29th against Lafayette, and for the first time this year in conference play, LIU Brooklyn reached the win column, following a 71-61 victory over Mount St. Mary’s on Monday night. The Blackbirds, who trailed by two at halftime, managed to pull away with a 17-7 run to start the fourth quarter, opening up a double-digit lead. Freshman Brandy Thomas produced a monster game, recording a career-high 36 points, to go along with 19 rebounds. The 36 points is the first 30-point game for LIU-Brooklyn since 2015 and the highest scoring game for an individual player in the entire NEC this season. The Blackbirds will next head a couple of subway stops over to Brooklyn Heights on Saturday, where they will play St. Francis Brooklyn in a rematch of last month’s “Battle of Brooklyn” showdown, before they play host to Sacred Heart at the Barclays Center on Monday afternoon in a President’s Day matinee. *CHAOS ON THE HILL: In a game that featured more twists and turns than the Space Mountain ride in Disneyland, the Wagner Seahawks outlasted the St. Francis Brooklyn Terriers 87-85 on a Monday night thriller atop Grimes Hill. It was a game that featured seven ties, six lead changes, and several dramatic swings of momentum along the way. Each team would manage to hold a double-digit lead, with St. Francis Brooklyn leading by as many as 15 points in the third quarter. Down 83-82 with 1:23 to play in regulation, Wagner’s Janelle Mullen stepped to the charity stripe and converted on a pair of free throws to give the Seahawks their first lead since the final seconds of the first half. Then with 11 seconds to spare, Terrier junior Jade Johnson drove the baseline, came off her dribble, and stepped through the defender to give her team back the lead, 85-84. Following a timeout, the Seahawks inbounded and got the ball to their leading scorer, redshirt sophomore Taylah Simmons, who connected on a shot from the lane to put the Seahawks up for good. Simmons and Johnson each produced 30 points for their respective teams, while Seahawk redshirt junior Janelle Mullen added a career high 20 points off of the bench. The Seahawks own a record over .500 in NEC play after 11 games for the first time since 2003-04 and find themselves sitting at fifth place in the NEC standings, just one game outside of the top four. After four straight years finishing at the bottom of the league, and forecasted to finish in 10th place once again in the preseason coaches poll this year, the Seahawks continue to open eyes, turn heads, and win games. Stay tuned for a special feature on the Seahawks next week here in the #NECWBB Fast Break column on the NEC Overtime! Blog. For the first time ever, the top two scorers in NEC history converged in the same place and at the same time on Saturday afternoon as NEC Hall of Famer Jess Zinobile returned home to Loretto to be honored as part of SFU’s “Legends Night” and 50 year celebration of women’s athletics at Saint Francis. Zinobile’s 18 year NEC scoring record of 2,338 career points was surpassed this past December by current SFU senior Jess Kovatch. In a special on-court ceremony prior to Saturday’s game against Central Connecticut State, Zinobile was honored with a tribute video and the unveiling of her #22 jersey proudly hanging on the wall of DeGol Arena. In a rematch of last season’s NEC Championship Game, the Robert Morris Colonials are set to return to DeGol Arena in Loretto for a sure-to-be-epic showdown with the Saint Francis Red Flash. The President’s Day marquee matchup will tip at 7pm on Monday night on ESPN3 with myself and Pam Roecker on the call. In 2018, the Keystone State rivals first met up in mid-January, with both still unbeaten in conference play. Megan Smith connected on a three pointer as time expired to give the Colonials a momentous win. Three weeks later, in the rematch, Jess Kovatch caught fire in the third quarter with six made threes, to lead the Red Flash to a 68-47 win. The season would finish with both teams tied at 16-2 atop the league standings. After all of the tiebreakers were exhausted, the final regular season RPI rankings ended up deciding the top seed in last year’s NEC Tournament, with the Red Flash just edging out the Colonials. When they eventually met up for a third time, in the deciding Championship Game, the Red Flash used the home court to their advantage. They slowly pulled away in the second half, on their way to a 66-56 win and their record 12th tournament title. Fast forward to the present day, both teams lost key components from the squads that met up in last year’s final, but both teams still find themselves operating at a championship level in 2019. Robert Morris has won 11 straight to start conference play, and has already wrapped up a postseason berth. We’ve been talking about RMU’s defense all season, and just like a boa constrictor coiling around its prey, the Colonials defense has gotten more and more suffocating over time. Robert Morris stands top 20 in the nation in scoring defense (55.3ppg allowed), top 30 in turnovers forced (20.5 per game), and top 60 in field goal percentage defense (37.1%). RMU boasts the sixth best turnover rate in the country, turning opponents over at a 25.4% clip. With just league games serving as the sample size, RMU has been even more impressive, allowing only 49.5 points per game and 32.9% shooting, while forcing 20.1 turnovers per game. Robert Morris will need to rely heavily on their defense going up against a Red Flash team that can score and shoot very well. In NEC play, SFU leads the league with 77.2 points per game and is third at 43.8% shooting. Offensively, while the Colonials are balanced, they are not that explosive. There was a four game stretch at the start of conference play where RMU reached 70 or more points four straight outings, including a season-high mark of 89 points against LIU Brooklyn. However, since that game, the Colonials have not scored over 70, and have only averaged 62.7 points per game. They do shoot at a high percentage, thanks to what can be a dominating post game with Nneka Ezeigbo, Nadege Pluviose, and Ire Ozzy-Momodu. Over the last seven games, RMU has been either been very close to, or over, 40% shooting for the game with 29.4 points in the paint. SFU’s improved zone defense and Courtney Zezza trying to defend the paint will be an interesting matchup to watch on Monday. For Saint Francis, they’ve been a team in flux most of the early season, but it appears they’ve finally figured things out. The reigning champs once again look like the team that cut down the nets at the end of last season, coming into the weekend having won their last five in a row. After Joe Haigh look a leave of absence two games into the season, which resulted in Susan Robinson-Fruchtl taking over the reins, SFU went through a series of abrupt changes, such as slowing down their offensive tempo a bit. Last season, the Red Flash averaged 79.8 possessions per 40 minutes (3rd in the nation), which led to 79.3 points per game (17th in the nation). This season, the numbers have taken a small dip, 75.8 possessions per 40 minutes and 73.6 points per game, however SFU is just as, if not more, efficient. Their shooting percentage and effective FG% have both increased and the team is sharing the basketball much better and more balanced, highlighted by 31 assists in a single game against Wagner back on January 28th. The team has also pulled back on their pressing with more of zone defense. These tweaks are changes that usually would take much of an entire offseason or pre-season to implement, but the Red Flash have had to pick them up on the fly. During their current five game win streak, SFU’s offensive numbers have been stellar: 145-298, 48.7% FG%…57-145, 39.3% 3pt%…87.2ppg. Finally, we come to Jess Kovatch, who will always be a factor and draw a ton of attention, as she leads the league and stands eighth in the country in scoring, at 22.1 points per game. While RMU has shut down some fantastic scorers, they’ve had trouble locking down Kovatch in year’s past. In seven career games against Robert Morris, Kovach averages 25.4 points on 42.3% shooting. Last year, in particular, RMU didn’t have an answer for Kovatch, as she went off for 34.3 points over the three meetings. For the most part, RMU would start with Jocelynne Jones on Kovatch and eventually they would bring Nina Augustin and other guards on her as Kovatch started to heat up. It will be interesting to see how Coach Buscaglia and the Colonials decide to match up against Kovatch this time around. It will once again be the irresistible force going up against the immovable object in a key Keystone State collision on Monday night. The Colonials will first travel to Mount St. Mary’s on Saturday afternoon, looking to equal the 2003 and 2004 Red Flash, the 2009 Pioneers, and the 2013 Quinnipiac Bobcats as NEC teams since 2000 to start a conference season 12-0. Meanwhile, in a little bit of a scheduling quirk, the Red Flash will have to trek all the way down to the Garden State for a one-game road trip, a Saturday afternoon game against FDU, before taking the long bus ride back up to Loretto to prepare to host RMU. A win over Saint Francis would get Robert Morris one step closer to assuring that this time around, any postseason meeting would take place in their own gym. Depending on how Saturday goes, a win could also open up a three, four, or five game edge over the Red Flash in the standings. For Saint Francis, they will look to stay hot on the trail of the Colonials for the regular season title race and also keep pace with Sacred Heart for the #2 spot in the standings. A SFU win could also possibly clinch a playoff spot for the Red Flash for the 10th time in the last 11 seasons. These two teams will meet up again in Moon Township to close out the year on the final day of the regular season on Thursday, March 7th. THREE: Jess Kovatch, SR (SFU): Jess Kovatch keeps doing Jess Kovatch things. Coming off back to back Player of the Week honors, the reigning NEC Player of the Year recorded a total of 57 points in her two games, her highest scoring conference weekend of the season. Kovatch is second in the nation in three point field goals made per game and is second in NCAA history in career made threes. TWO: Taylah Simmons, R-SO (WC): Simmons and Kovatch swap places this week in my ‘Three Stars’ with Simmons moving up to number two thanks to a monster game on Monday night that saw the Seahawks upend the Terriers. After 22 points and 10 rebounds on Saturday at LIU Brooklyn, Simmons recorded a season high 30 points, along with 12 rebounds against St. Francis Brooklyn. Her bucket in the lane with eight seconds to go would prove to be the game winner, leading the Seahawks to their first three game win streak since 2014-15. The redshirt sophomore has strung together three straight double-doubles to increase her total up to six on the season. ONE: Brandy Thomas, FR (LIU): The initial reaction from her head coach, Stephanie Del Preore, who was caught on audio talking to herself while first catching a glance of the stat sheet prior to the start of her post-game interview on NEC Front Row, pretty much said it all: “Holy crap, 36 and 19, Brandy had a day!” On Monday night against Mount St. Mary’s LIU freshman Brandy Thomas had one of the most impressive outings in the entire conference this season. Her 36 points and 19 rebounds not only established personal career highs, but was the top individual scoring game this season in the league, helping lead the Blackbirds to their first conference win of the year. Thomas recorded double-doubles in both games played this past weekend, her ninth and tenth double-doubles of the season. *On Monday night, SFU’s Jessica Kovatch is set to play in her 11th, and what could end up being her final, ESPN3 NEC game. Kovatch has risen to the occasion and put on a show just about every time the national broadcast cameras have come her way. In her career, Kovatch averages 28.1 points per game on 44.7% shooting and 43.2% from behind the arc in ESPN3 broadcasted conference games. Just as impressive, is her team’s 9-1 record and current eight-game NEC on ESPN3 win streak, with the Red Flash’s last ESPN3 loss against a league opponent coming back in Kovatch’s freshman year, a 92-71 semifinal setback against Sacred Heart. A very special thanks this week to Mount head coach Maria Marchesano and senior guard Juliette Lawless. Be sure to join us back here at the NEC Overtime! Blog next Wednesday, February 20th for a brand new WBB Fast Break column, as we sit down with the Wagner Seahawks and discuss their surprising start and run towards a playoff berth for the first time since 2014.